Having followed a very similar concept since the 2009 F60, Ferrari found in 2011 that the conservative route was not making up the ground to their rivals. The F150 was a fast car, but lacked that final ounce of pace to beat the Red Bulls and McLarens. This was exacerbated by the car being easy on its tyres, to the point where it had tyre warm up issues. This showed itself in qualifying were the car would not make the most of a tyre around a single lap and also in cooler weather, or where the harder Pirelli tyre was used. The team recruited Pat Fry in a major reshuffle of engineering staff. Fry spent the year assessing Ferrari problems and set about a recruitment programme of new staff and a more adventurous design programme. The resulting car is clearly very different from its predecessors. Externally very little remains the same on the new car, it does perhaps shares Ferraris favour for a long wheelbase and clearly is set up to run a fairly steep rake angle. 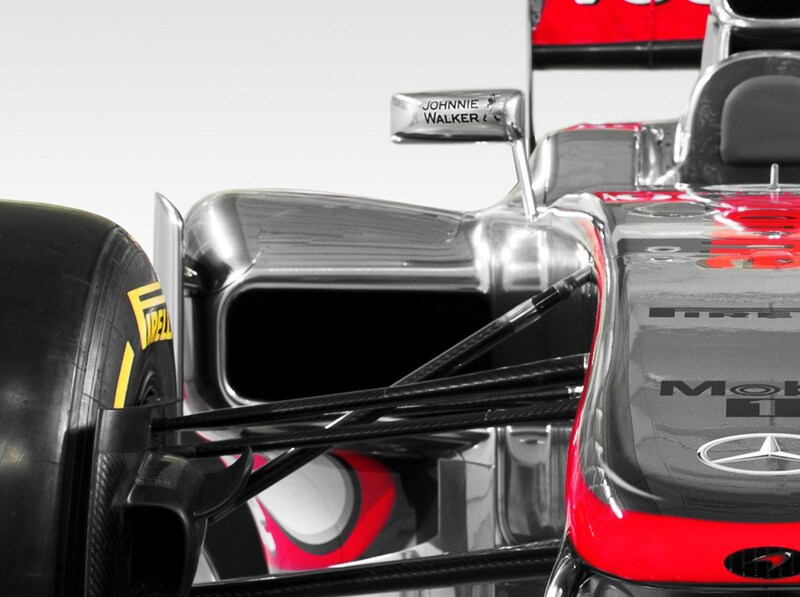 But only the front wing, which is derived from the late 2011 wing appears to be carried over. 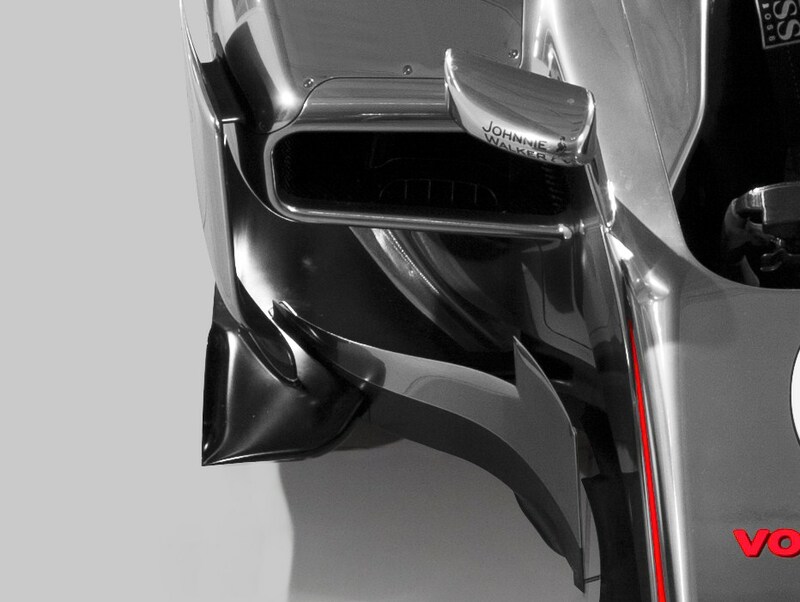 Even this detail was a development in preparation for 2012, Fry leading the team to follow Red Bulls format of front wing in both shape and aero elasticity. With a similar wheelbase, the revised seating position is perhaps the only change to the cars layout. The seating position was altered for Fernando Alonso last year and has been altered once more for a lower position. 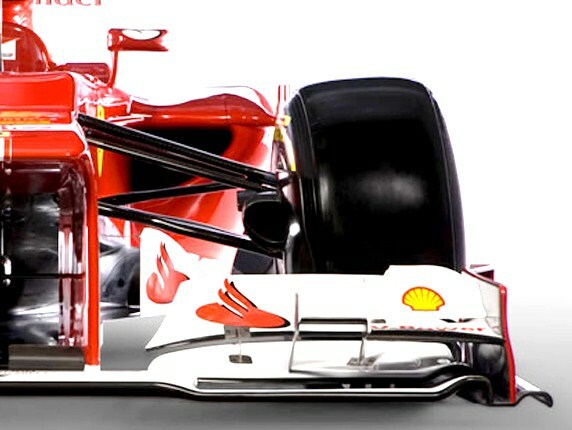 Of all the 2012 front ends Ferrari has one of the most striking, the nose being very wide and square in cross section. 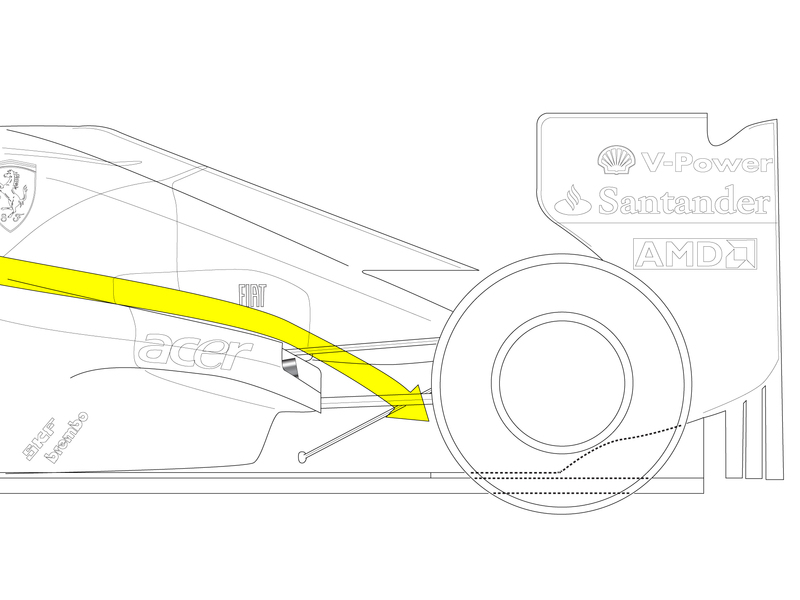 The width is part of philosophy to use the extended wing mounting pylons, as a pair of turning vanes cascaded with the normal undernose turning vanes. 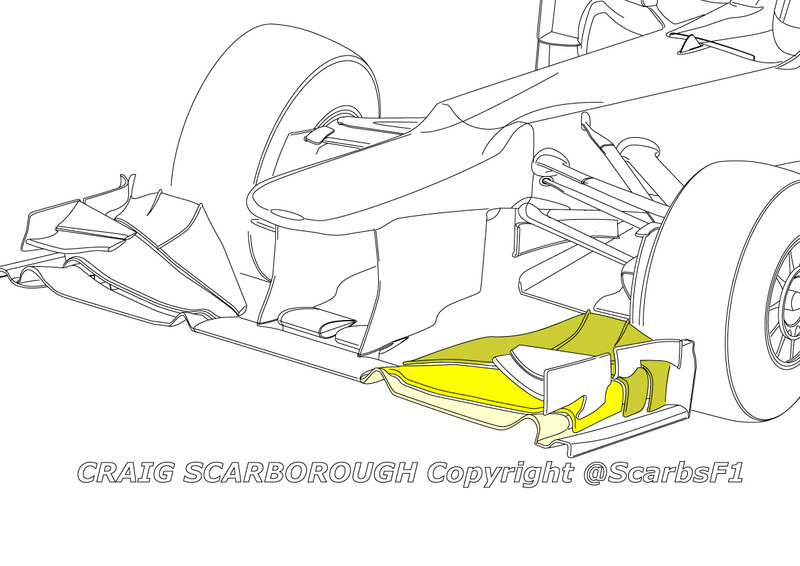 By making the nose as wide as possible within the space allowed within the regulations, more undernose surface can be used to accelerate air through the duct formed by the nose and vanes. As a result the edges are tightly radiussed and cannot be rounded as with other teams. The aesthetics of the nose being also worse for the rectangular cross section front bulkhead. Ferrari opting not to make a “V” shape of the bulkhead, in order to make the area under the raised chassis uncluttered to make the vane set up work most effectively. 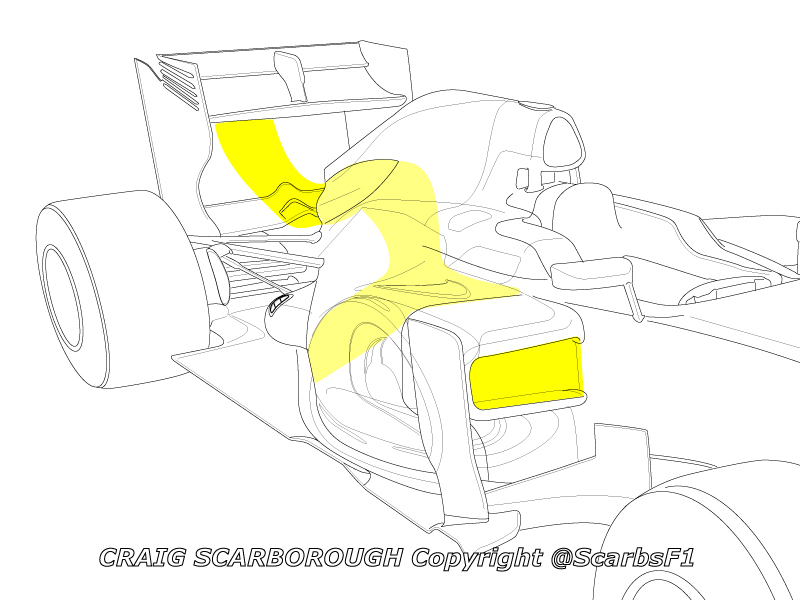 The flow through this vane set up starts with the wing mounting pylons, these are wide spaced at their leading edges and they then converge to end inboard of the main turning vanes. 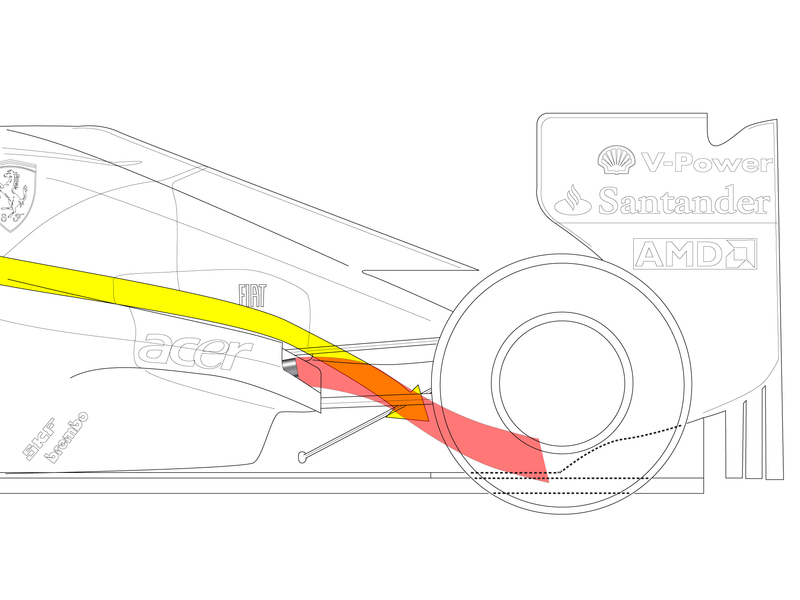 The main turning vanes then pick up the flow accelerating between the pylons and sweep out to direct the flow towards the lower leading edge of the underfloor. 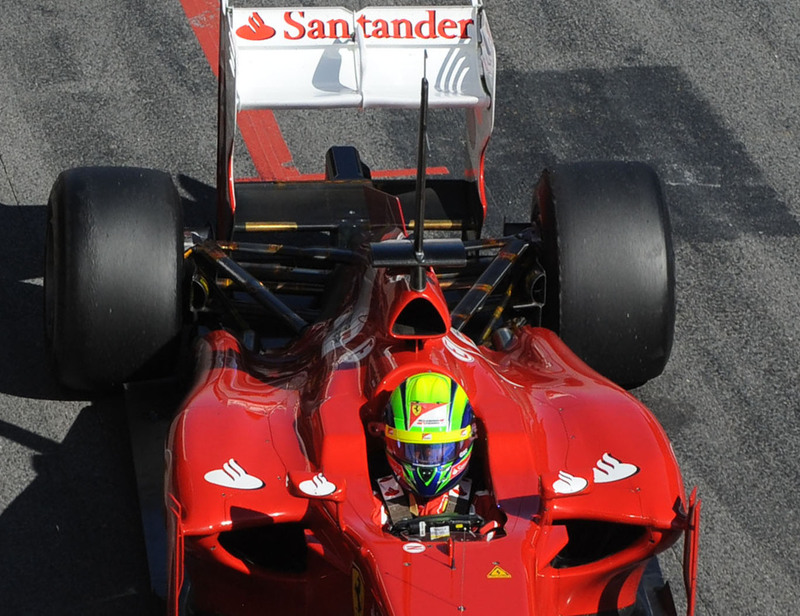 Curiously Ferrari has yet to fit a driver cooling vent into the nose. This hole is not mandatory and clearly not a requirement for a chilly Spanish pre season test. 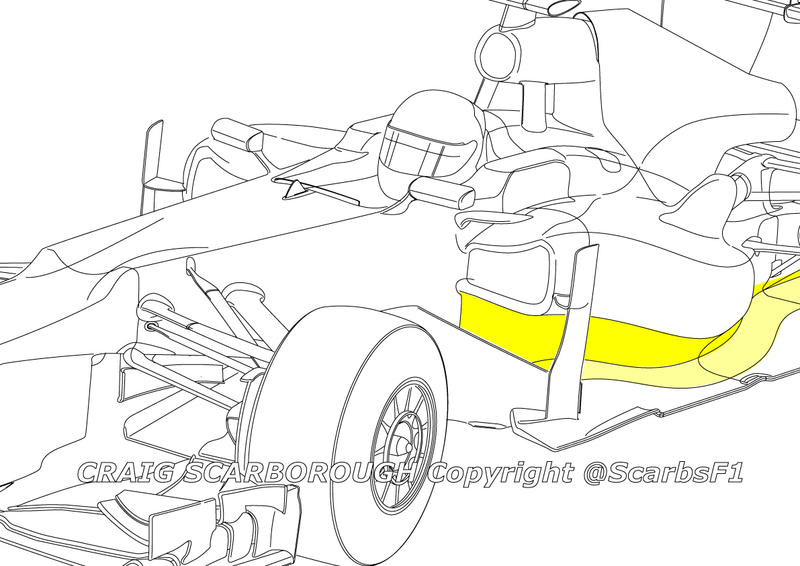 As previously mentioned, the front wing is a derivative of the late 2011 wing. This was extensively detailed in a previous post. The wing is a three element set up, the main plane being slotted to create the leading two elements, and then the flap trails this. An extra slot in the down-turned corner of the flap helps keep flow attached in the steepest section of wing. The footplate is formed by the wing curving down on itself, while the upper section of endplate is a separate vane, albeit joined along a lot of its length to the foot plate. 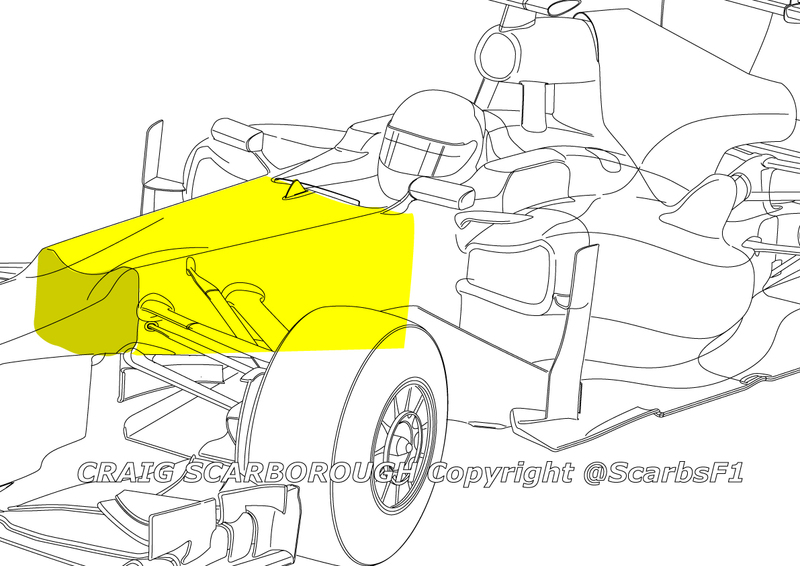 Front wings are now subject to a doubling of the deflection test used by the FIA 2011. So far the Ferrari wing has not exhibited the flutter seen last year, which is not to say it is not flexing. 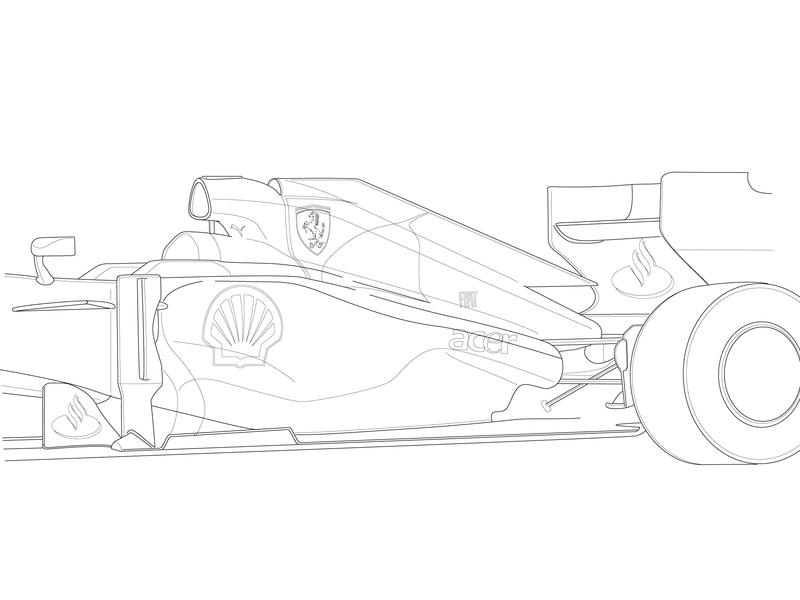 A mention of front suspension in the cars launch analysis will be unique to Ferrari this year, as they have revisited an old direction with its layout. Every other car for well over ten years has had pushrod front suspension, but Ferrari has revived the pullrod set up for the front of the car. This effectively turns the pushrod set up upside down, now the rod passes down from the upper wishbone and connects with the rocker, which is now mounted at the bottom of the chassis. According to Fry, this set up is a little lighter and has a slightly lower Centre of Gravity. 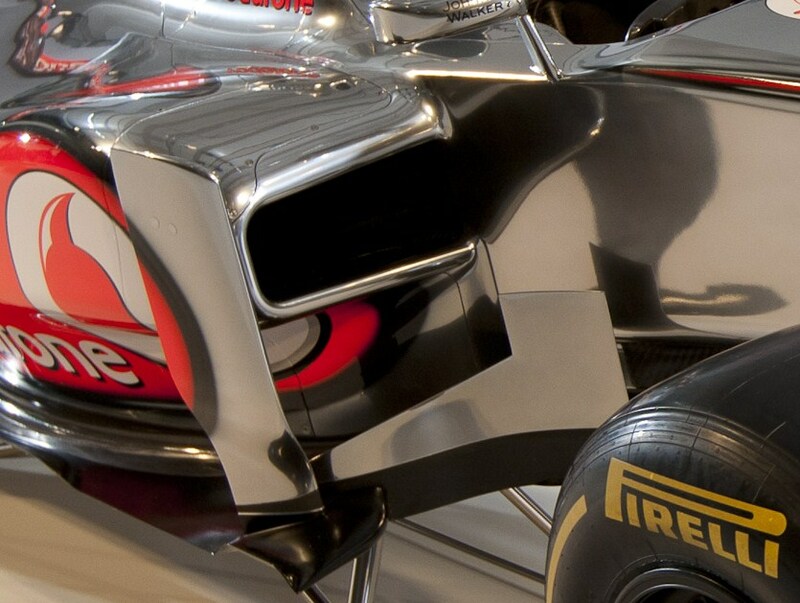 These gains alone will not pay for the systems inclusion on the car, so the team claim to have found an aero benefit. The pullrod can be thinner, but the real gain is the pullrod is mounted near horizontal across the front suspension. This places it in line with the upwash from the front wing. Just as with the wishbones, its profile can be subtly altered within the rules to help control the wake from the wing and improve the airflow over the rear of the car. Despite appearances the pullrod is as effective in moving the rocker for a given wheel travel as a pushrod. The important factor is the angle between the rod and the wishbone is connected to, rather than the rods angle to the chassis. 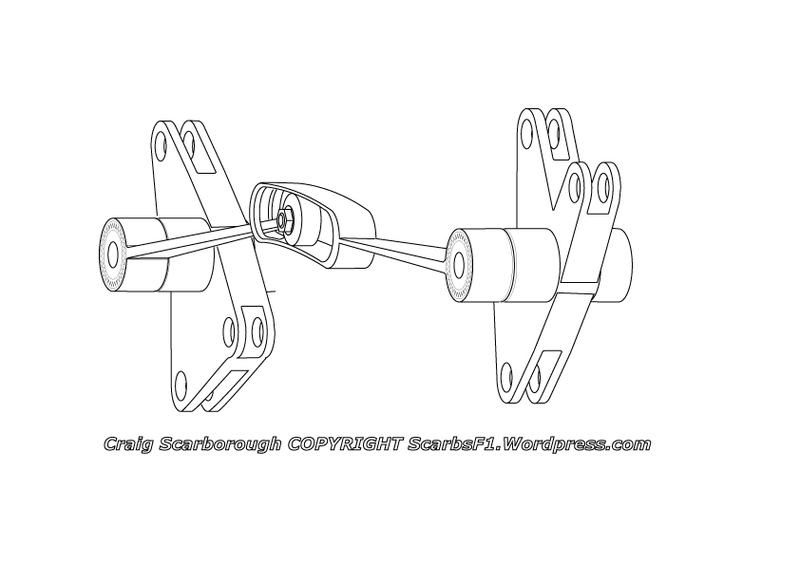 I’ll explain a lot more pull rod suspension in a subsequent article. Although not a performance differentiator, the new roll hoop is very different concept to that seen in previous Ferraris. A far curvier pair of inlets are formed by the structure, this shaping being at odds with the ungainly nose. 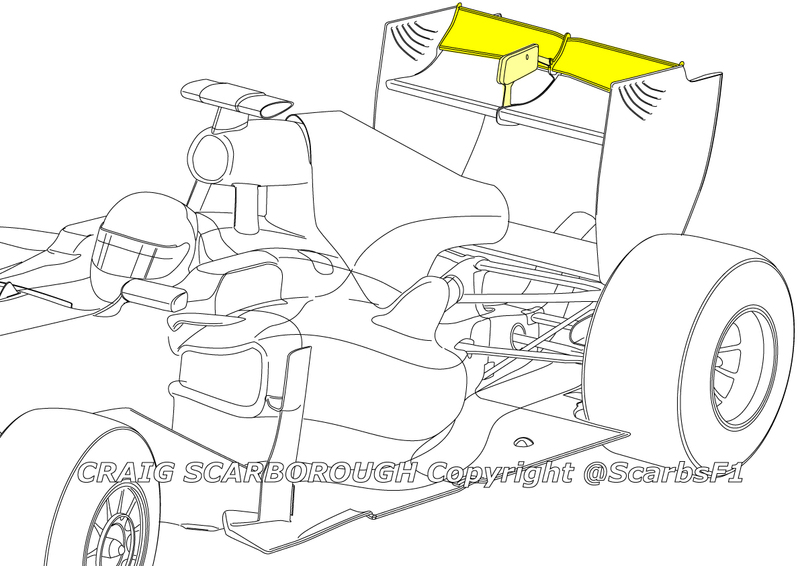 It is strange Ferrari have not undercut this area and exposed the structure supporting the roll hoop, which is the common practice to achieve more airflow to the rear wing. 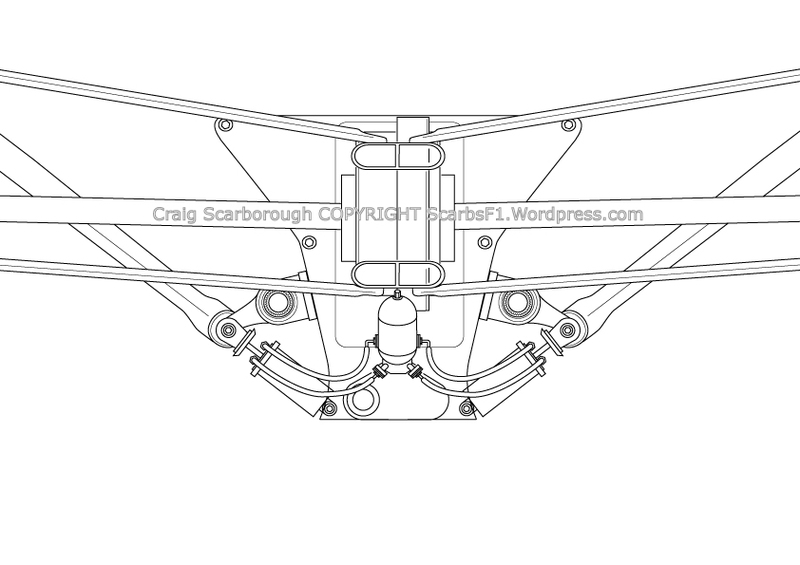 The main inlet feeds the engines airbox, while the smaller inlet piggy-backed behind it, most likely feeds the gearbox and hydraulic oil coolers mounted above the gearbox. The lifting point for the trackside cranes is formed by beneath the main inlet and enclosed by a simple bar connecting it to the top of the chassis. 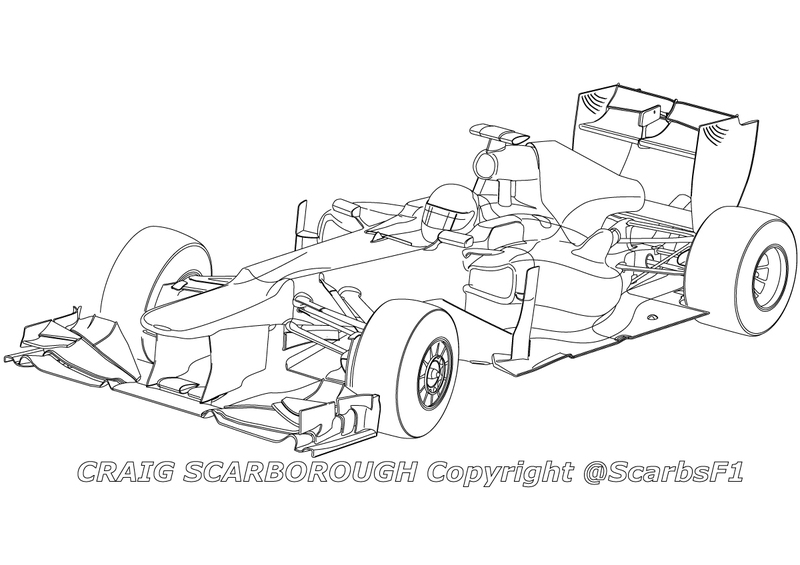 It’s perhaps the sidepods that are the big performance area for the car this year. 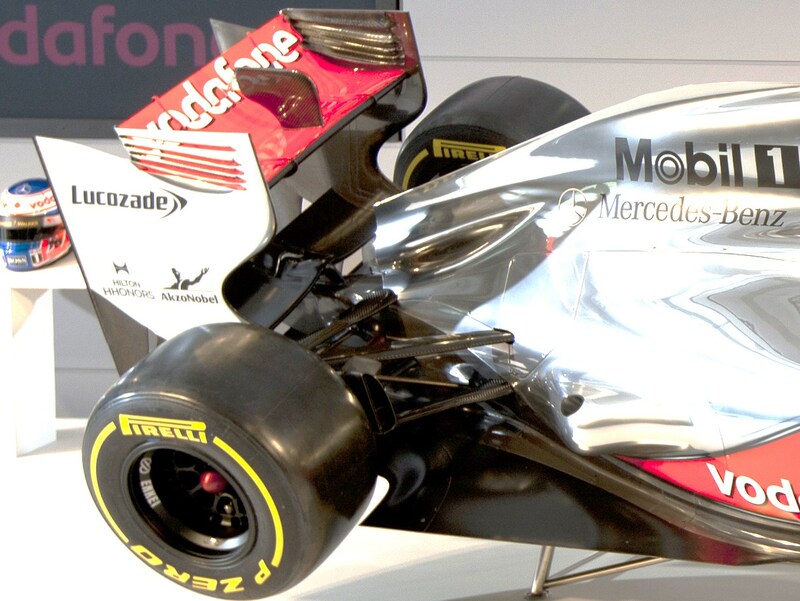 Starting at their leading edge, the car sports a new format Side Impact Spar (SIPS) design inside the bodywork. 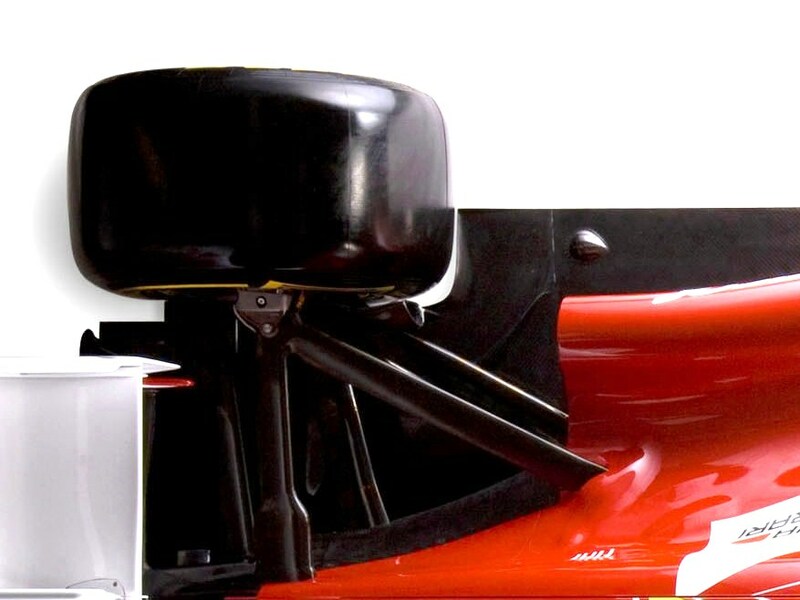 Since 2009 Ferrari had a staggered SIPS arrangement, with a narrower spar sat ahead of a wider spar, creating the distinctive peaked sidepod inlet. 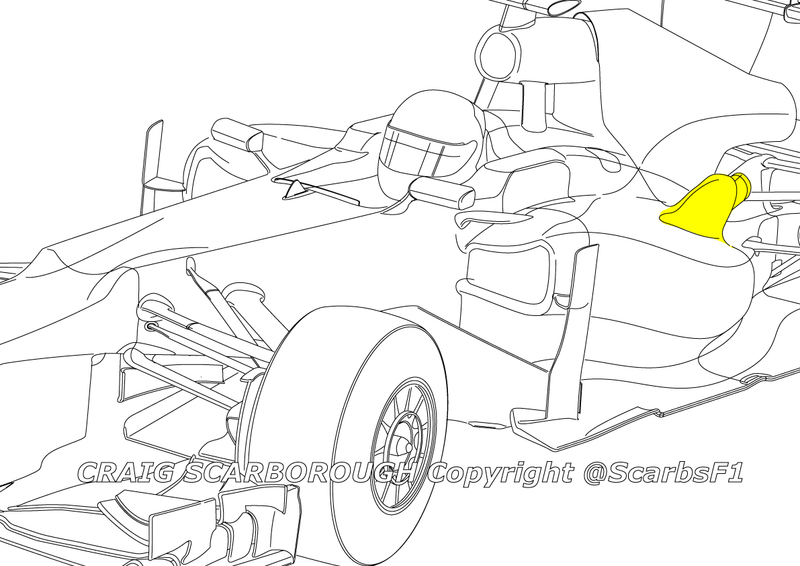 Now it spears a single spar spans the sidepod and protrudes through to form the mount for the sidepod vane. This allows the spar to be wider, which creates an easier job to absorb the impact. Viewed from above the sidepod inlet lean inwards. 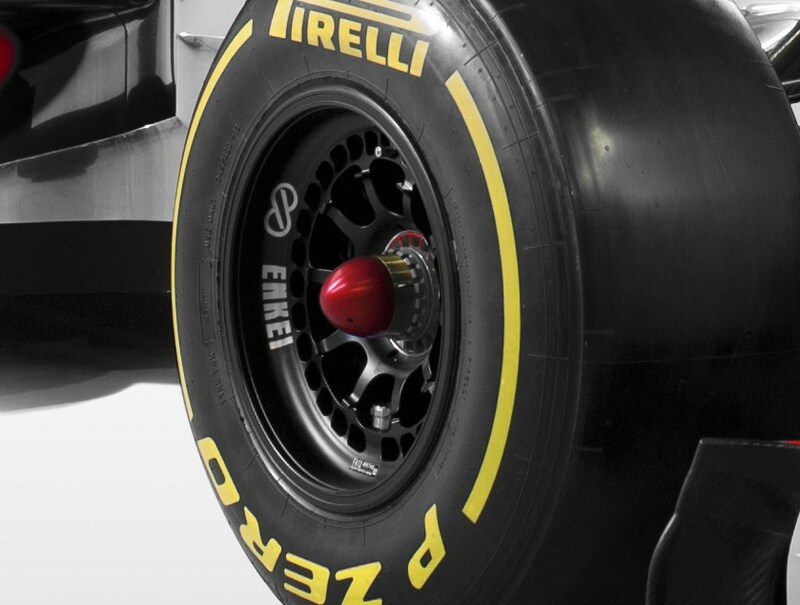 This makes them more efficient at meeting the diverging flow that passes around chassis to enter the sidepod. 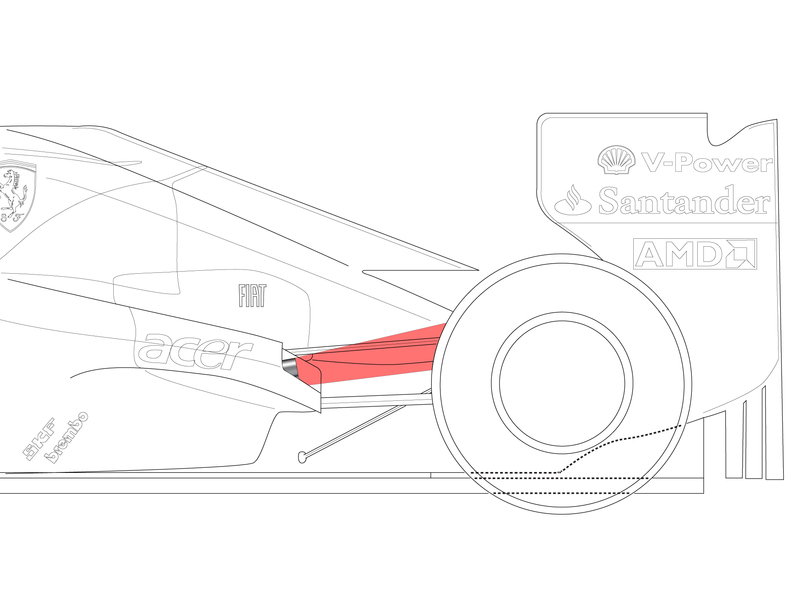 Much smaller and far more undercut, the sidepods now feature radiators mounted upright and splaying outwards from the rear of the car. Their new placement allows the flow through the cores to be directed outboard, rather than in towards the central tail funnel. This heated flow from the radiators passes out through the downswept chimney-fairings that differentiate the car from its rivals. 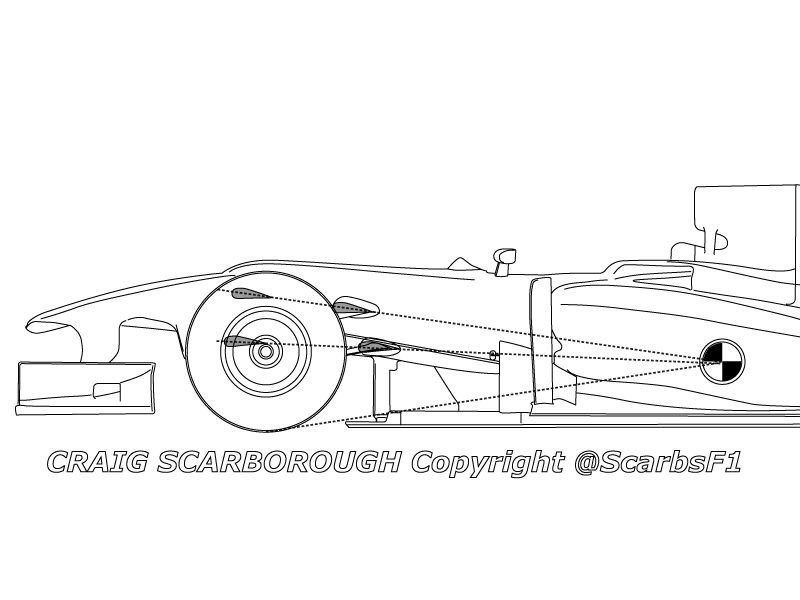 This design keeps the centre of the car as slim as possible, with there being no tail funnel to obstruct the rear wing. 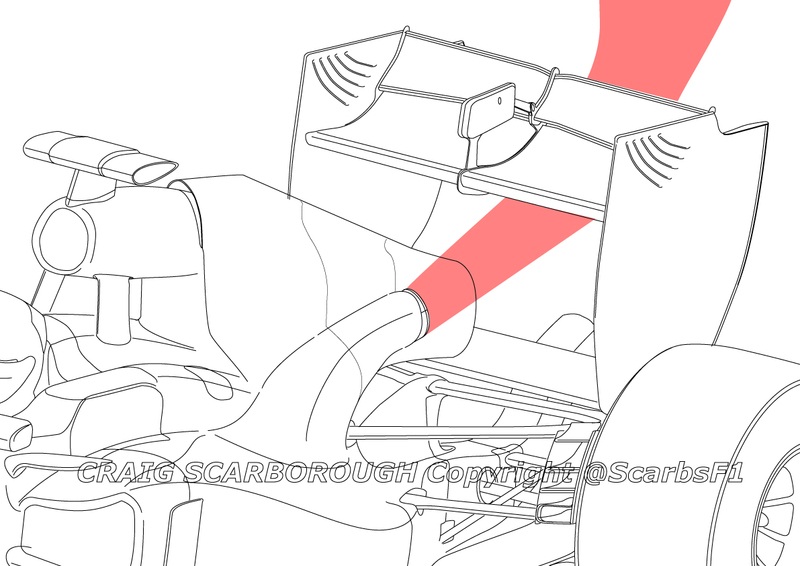 Airflow passing through the undercut in the sidepod, still enters a coke bottle shape below the chimney-fairings and is passed over the diffuser. But these chimney-fairings also have a more important secondary use, for housing the exhaust outlets. 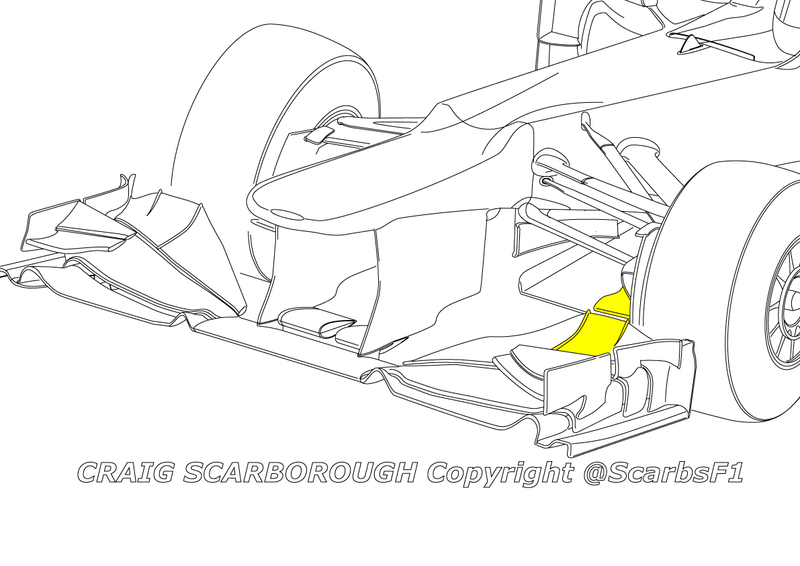 Additional cooling outlet area is provided in the tail of the sidepods, in between the rounded end of the chimney-fairings and the gearbox fairing. This gearbox fairing is nearly round in cross section also forms an outlet for hot air to exit from the engine bay. With floor level exhausts no longer allowed, the teams have had to find different ways to make use of the powerful exhaust plume. 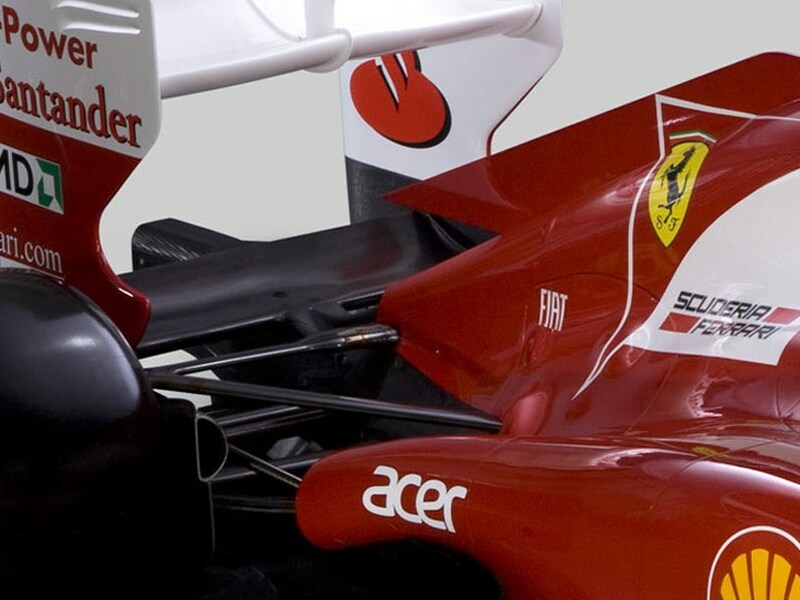 Most teams have directed it over the sidepods towards the centre of the beam wing, but Ferrari have purposely placed the exits as far outboard as allowed (on the launch spec car at least). 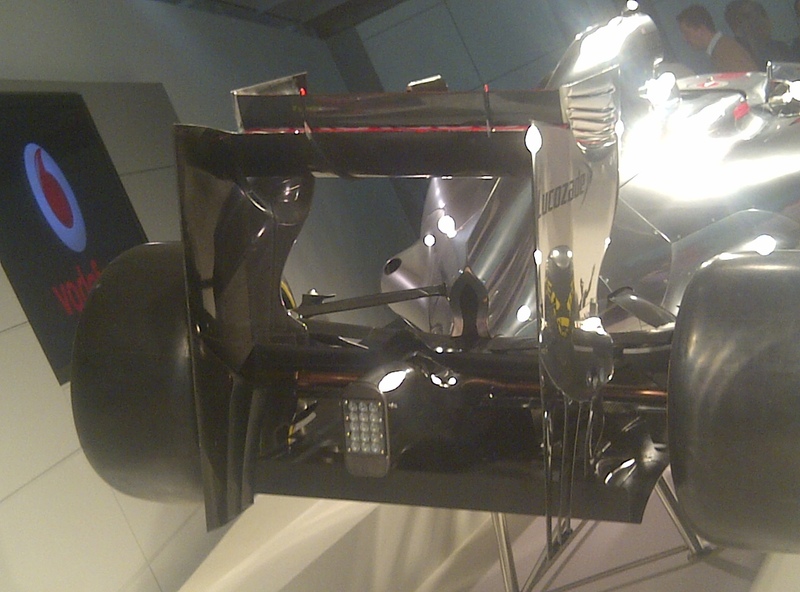 When viewed from above its clear these are aimed outboard of the rear wing endplate. Sat inside the downswept chimney-fairings, the exhaust at first might be thought to be pointing downwards. But the rules state the exhaust outlets have to point upwards by at least ten degrees. Although not visible inside the chimney-fairings, the last 10cm of exhaust do indeed point upwards. But the cleverly the down sweep of the chimney-fairings creates a downwash effect over the exhaust plume and this directs the combined flow downwards between the rear brake ducts and rear wing endplate. 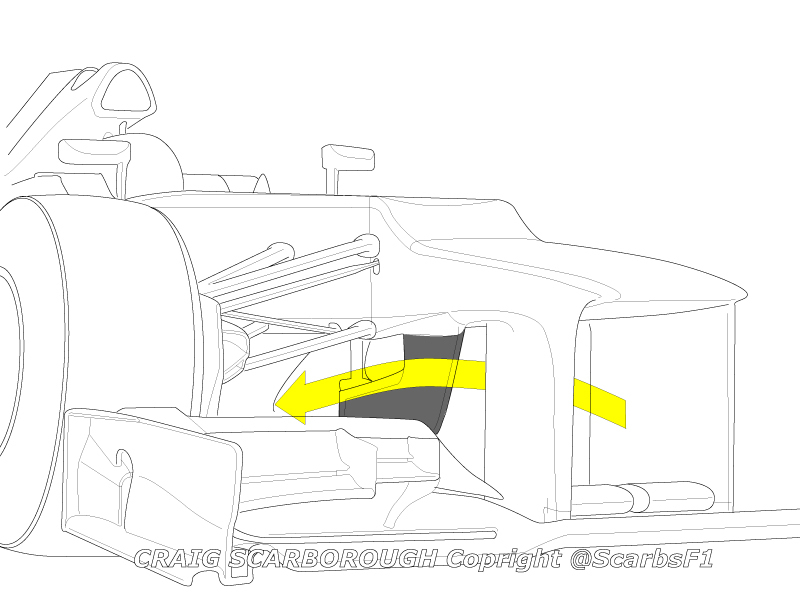 This set up will potentially reach the floor and act to seal the diffuser from the ground as with the 2011 EBD. In testing the set up has gone through several iterations, firstly the exhausts exits were in line with the end of the chimney-fairings, but soon the exhaust tail pipes were shortened and the chimney-fairings above had to be cut back to maintain legality and also the allow the downwash flow to reach the shorter tailpipe. At the Barcelona test the exhausts were again altered, this time being brought further inboard, approximately in line with the channel formed between the chimney-fairings and the engine cover. 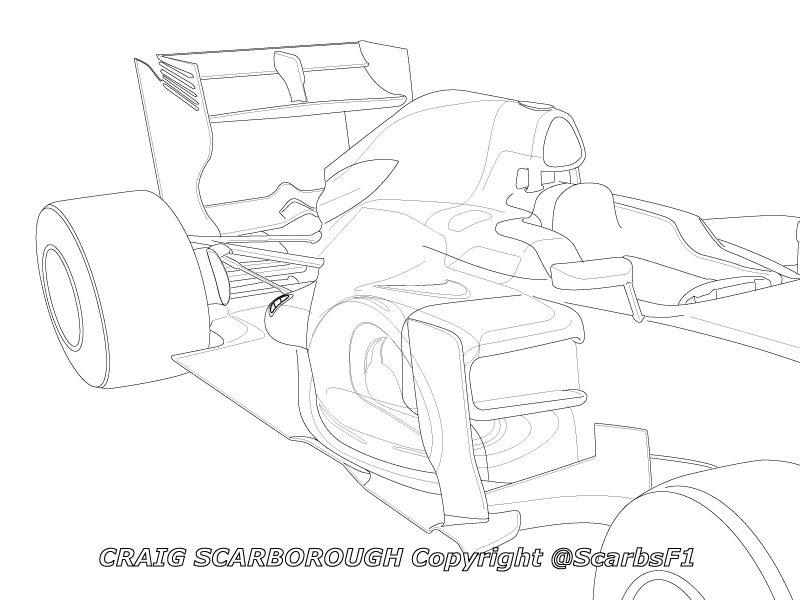 Now the exhausts appear to point inboard of the rear wing endplate. It’s not clear if this is an aerodynamic decision or a request for a less obviously aerodynamic solution from the FIA. Should the exhaust outlet stay in this position the sidepod and the chimney-fairings will need to be altered to optimise the downwashed airflow around the tail pipes. Almost unspoken of amidst the talk of the front pullrod set up, Ferrari also switched their rear suspension on its head and gone for pullrod on the rear of the F2012. Last year we saw the Ferrari had a very complex setup around the rear suspension rockers and placing this hardware lower down around the clutch and engine drive shaft, will be a tough task package. 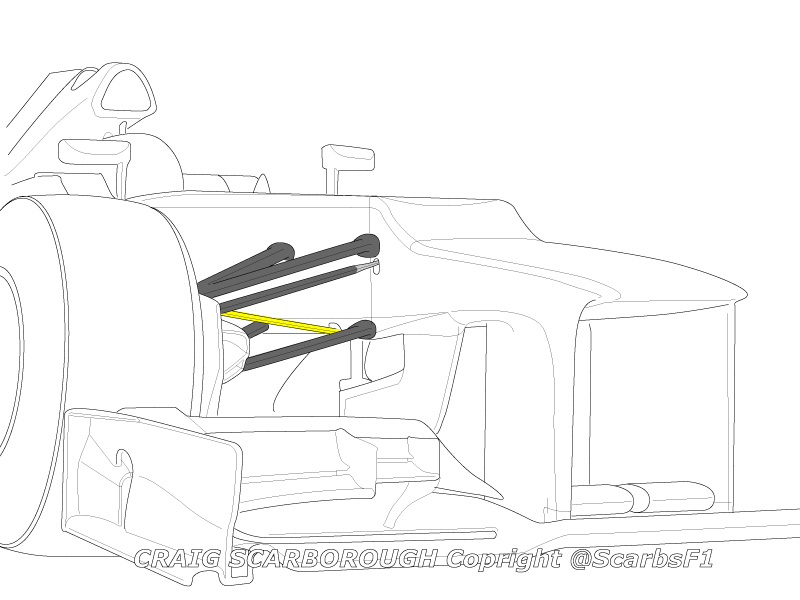 Mounted to the revised gearbox, the rear top wishbone has been repositioned this year. 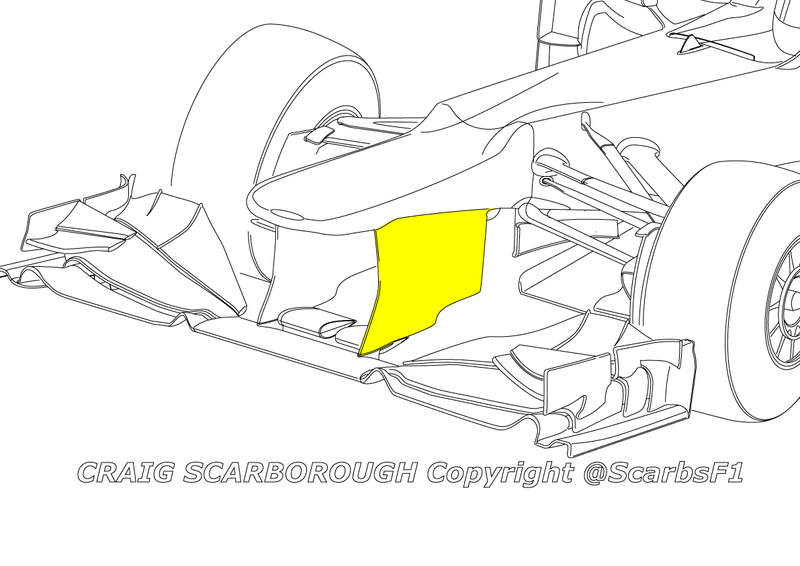 It appears to be nearly horizontal; this places it in line with the beam wing, so the wishbone can act as a flow conditioner ahead of the wing. 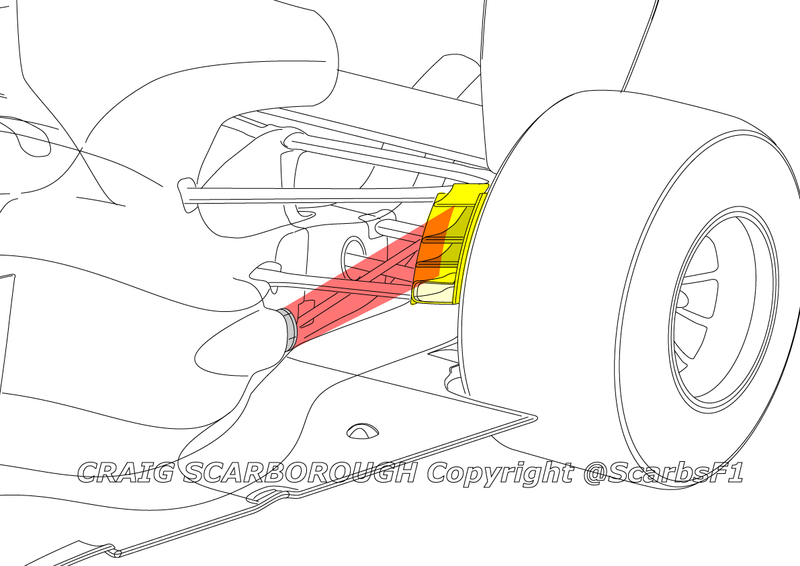 Even if the new gearbox is not as low as the Williams, the wishbone needs to mount to a vertical extension above the gearbox. 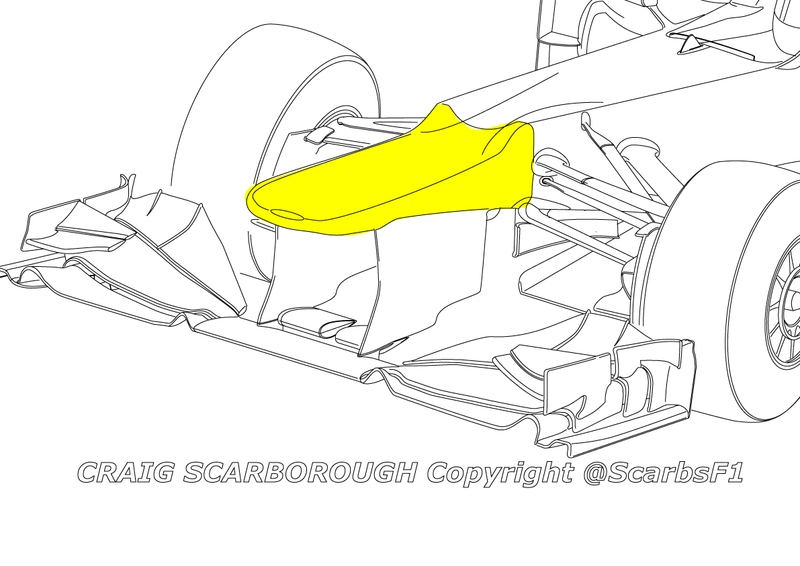 This wishbone mounting hard point also forms the mounting for the beam wing. At first this appears to be a duct, but is just the thick swan-neck mounting similar to that used by Marussia for the past two years. 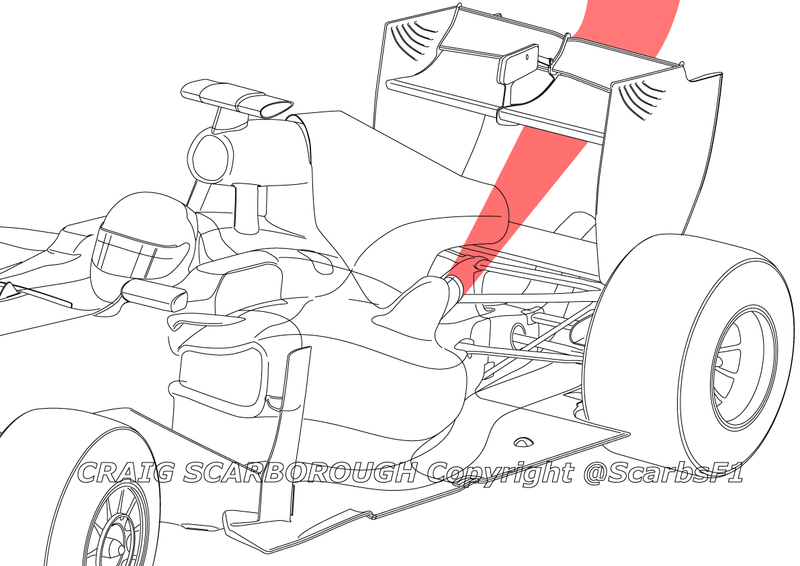 Within the bodywork rules, there is not a lot of scope for a very different diffuser. 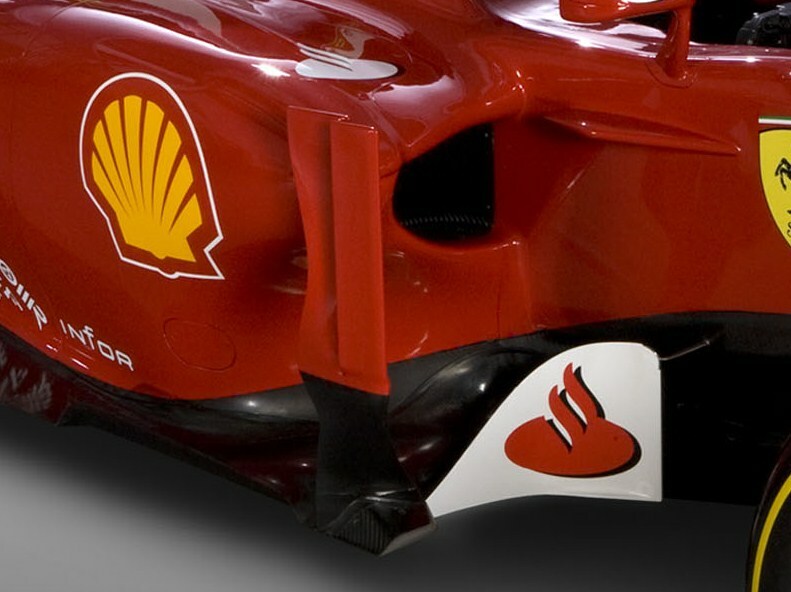 So Ferrari have now added a full width flap around the diffuser on the new car. 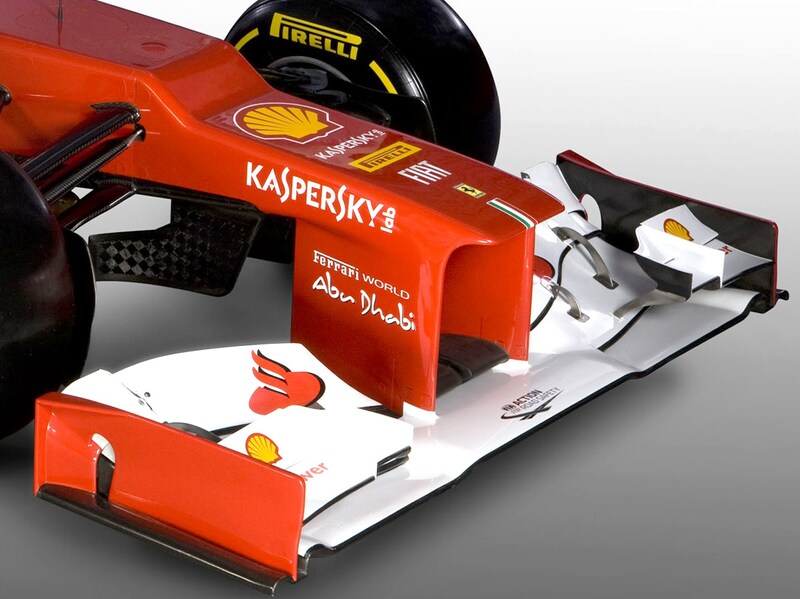 Unusually Ferrari have not fully exposed the underside of the beam wing above the rear crash structure. Looking at the crash structure itself its clear it is shallow enough to allow this. Instead the crash structure has additional bodywork above and below it, which merges it with the beam wing. As already mentioned the gearbox is a new design. The hybrid carbon and titanium case now has to mount a very different rear suspension system, with the switch to pull rod spring\damper operation and the raised upper wishbone. Last year Ferrari were notable for having a single selector drum for their seamless shift set up. Most teams use two selectors; each one operating alternate gears, so that the phasing from one gear engaging and the other disengaging can be adjusted. Ferrari with a single selector must be confident that their system can always shift with the same aggressive phasing, without the option to go for a longer overlap. Ferrari develop their KERS with Marelli, the system retains the same layout as in 2011 with the MGU mounted to the front of the engine and the Batteries placed under the fuel tank. The power electronics reside in the right hand sidepod. With the engine freeze, not much can be said of the engine. 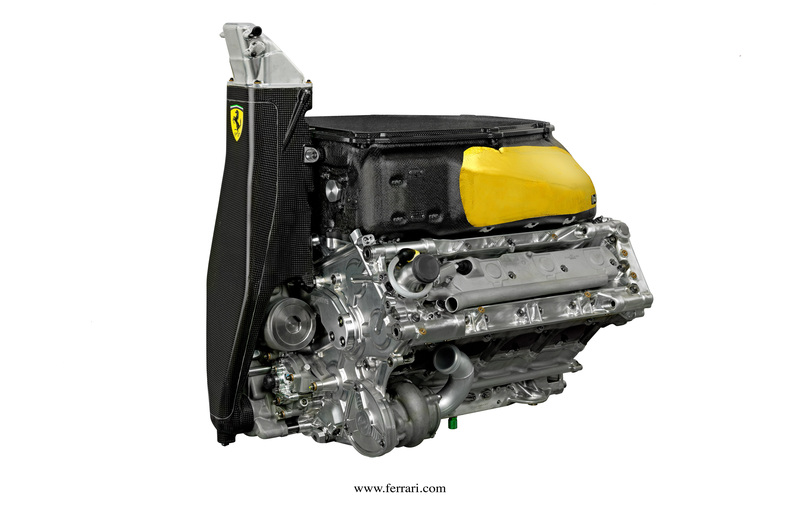 Ferrari have usefully provided a high resolution image of the 056 engine, complete with integral oil tank, but lacking the KERS MGU. Lotus Renault GP (LRGP) have been on one of the teams most innovative with their suspension over the past decade. As RenaultF1 They introduced the Tuned Mass Damper (TMD) back in 2006 and have since raced conventional Inerters. Inerters are a special component in the suspension to counteract spring effect of the Tyres\Suspension, using a spinning mass on a threaded rod to control these loads. LRGP have also been one of the teams racing hydraulically interlinked suspension and have looked at other ways to legally alter the suspensions performance. It seems this work has lead to the discovery of a new form of Inerter, primarily using fluid for the Inerter effect. This new development has been termed by the team a “Fluid Inerter”. The intellectual property rights to this development have been safeguarded by Patent, allowing the details to be freely accessible in the pubic domain (the source for the picture at the top of this article). My attention was drawn to this development by Italian Mechanical Engineer Rodolfo De Vita, a specialist in Torsional Dampers and Dual Mass Flywheels (DMF). 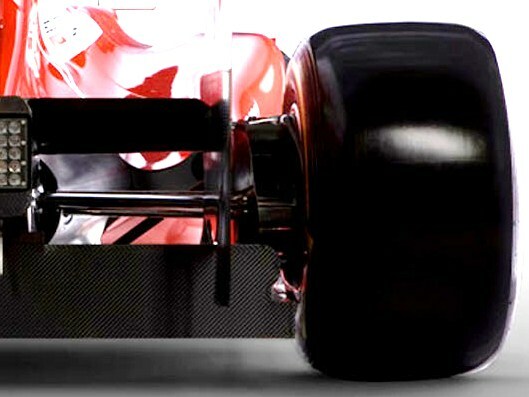 Becoming ever more complex the suspension in an F1 car has a number of devices to counter loads fed into the chassis, in order to maintain the ideal conditions at the tyre contact patch. We understand the role of springs and dampers, but there remain other spring effects within the suspension system, not least from the high profile tyres. Their spring effect goes undamped and hence is largely out of the control of the teams in setting up the car. Being able to counteract these uncontrolled forces in a suspension will allow the tyre to main better contact with the ground for more consistent grip. In 2003 Cambridge Universities, Dr Malcolm Smith proposed a mechanical method of controlling these loads via the Inerter. 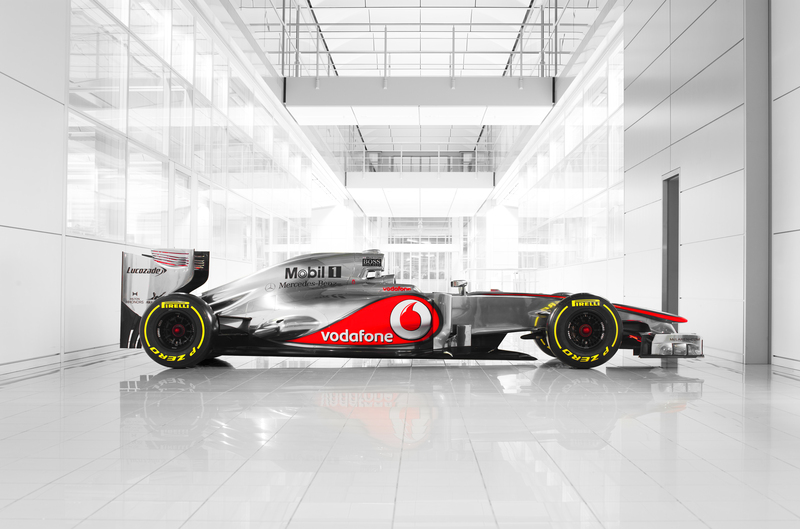 McLaren took up this idea and tested the idea in 2004 then went on to race an Inerter in 2005. In size and construction the Inerter looks like any other damper. Being placed in the same position as a Heave Damper it was well hidden and unknown to most people. Until the “Spygate” saga in 2007, when the design was referenced as both the “J-Damper” and “a Damper with a Spinning Mass”. 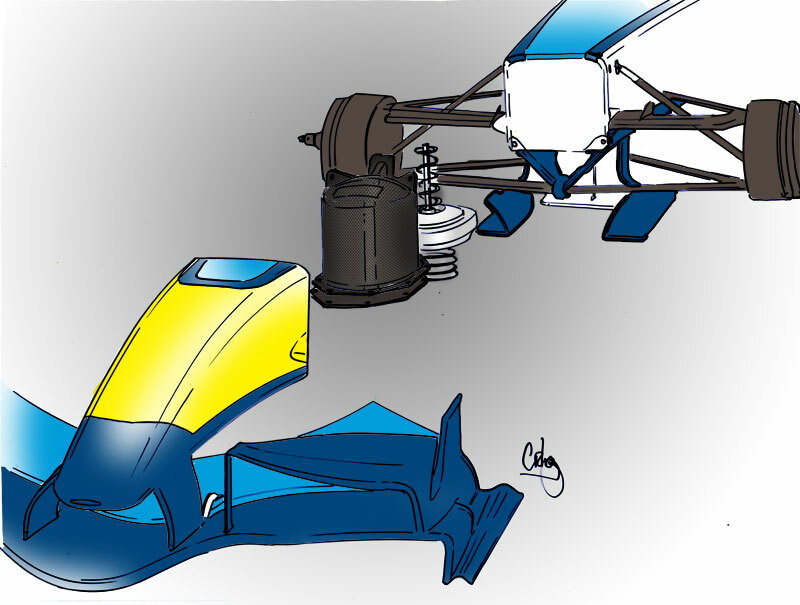 It wasn’t until May 2008 that I was able to understand and expose the details of the Inerter concept, publishing its details in Autosport.com (subscribers only http://www.autosport.com/journal/article.php/id/1554 ). Co-incidentally this article is cited in the patent documentation! An Inerter can be configured in two ways: a linear and a rotary format. In both guises the device uses a toothed drive to spin a mass. Likened to the same effect as a bicycle bell, the load fed into the bells lever is dissipated by the spinning element. 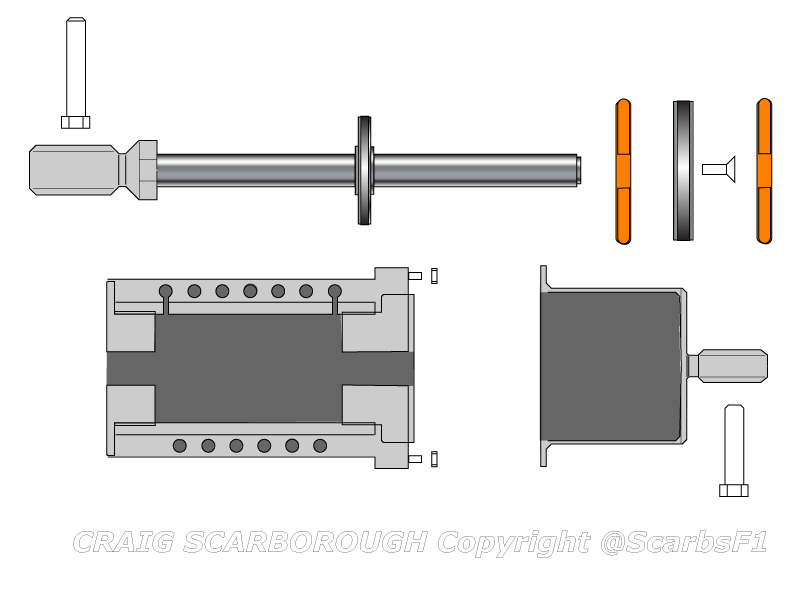 In F1 teams use a cylindrical mass screwed onto a threaded rod inside a damper body. One end of the rod is affixed to one side of the suspension and the damper body to the other side of the suspension. 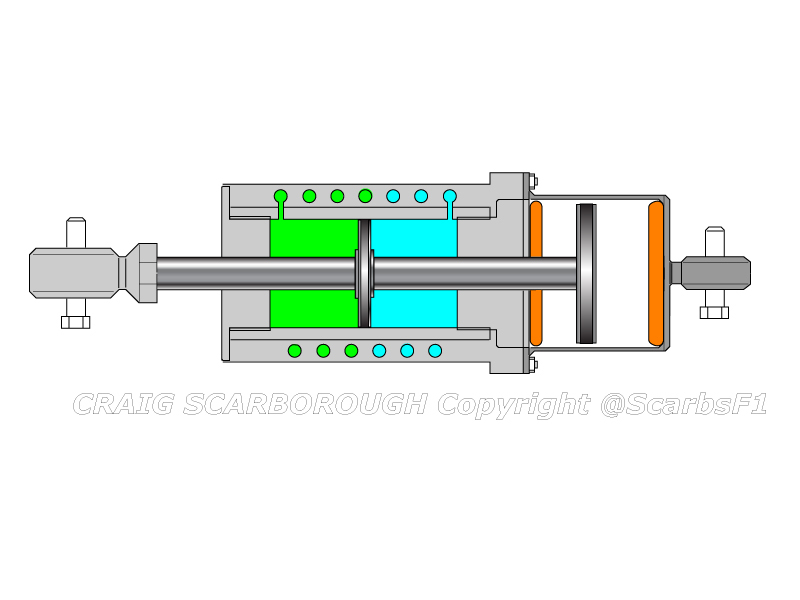 Reacting to the acceleration of the suspension, the Inerter absorbs the loads that would otherwise not be controlled by the velocity sensitive conventional dampers. The Inerter predates Renaults TMD, which aimed to achieve the same effect. 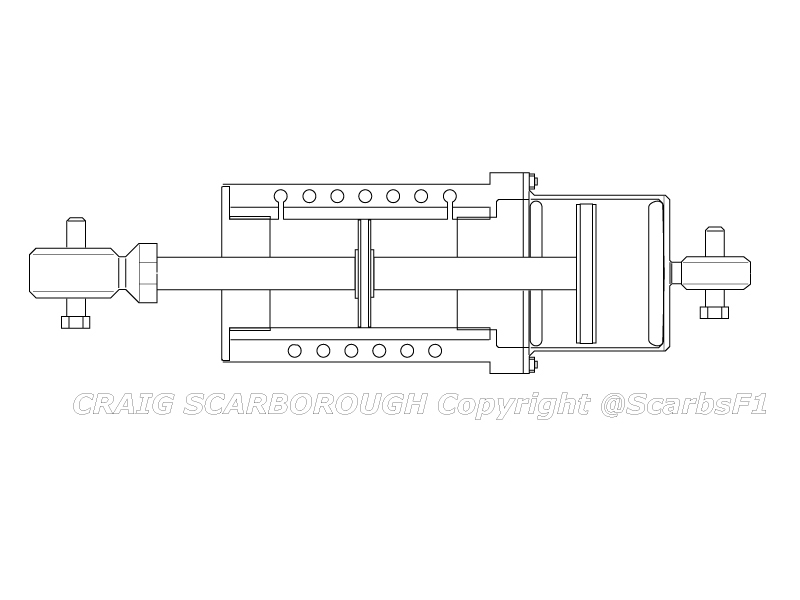 With the TMD a weight is suspended on spring to offset the same forces being fed into the chassis as the Inerter. Renault first raced the TMD in 2005, its discovery by Giorgio Piola around Monaco of that year; both forced a development race and an enquiry by the FIA. It was subsequently banned on what proved to be false grounds. The FIA citing a movable aerodynamic effect as the reason for its ban. Unaware of its effect on the contact patch, I initially saw the device as a means to prevent the front wing pitching downwards when braking. 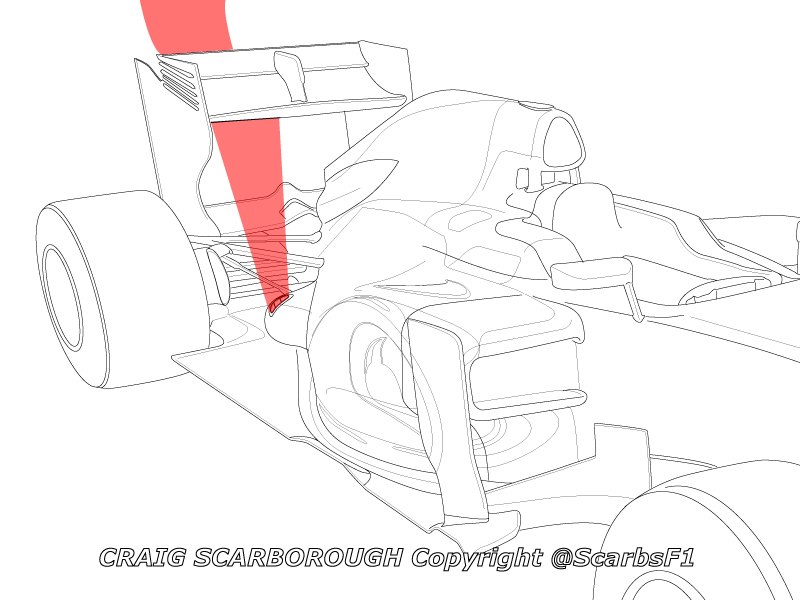 The inertia of the suspended mass keeping the nose from pitching downwards during the initial braking phase. This I thought would prevent the car from being pitch sensitive. Despite a lengthy court room case, this “aero” function was upheld as the reason for the ban of the device. Ironically the McLaren was using the Inerter at the time, and despite it being used for the same function was not banned and remains legal and in universal use to this day. Reading the detail of the LRGP patent, it’s clear this was at least partly a surprise discovery. The Patent states the discovery was “based on lab testing of another hydraulic suspension device”, when it was found that the effect of the fluid within the system “has a very significant inertia effect”. I would suspect this discovery was made during the development of the linked suspension system. 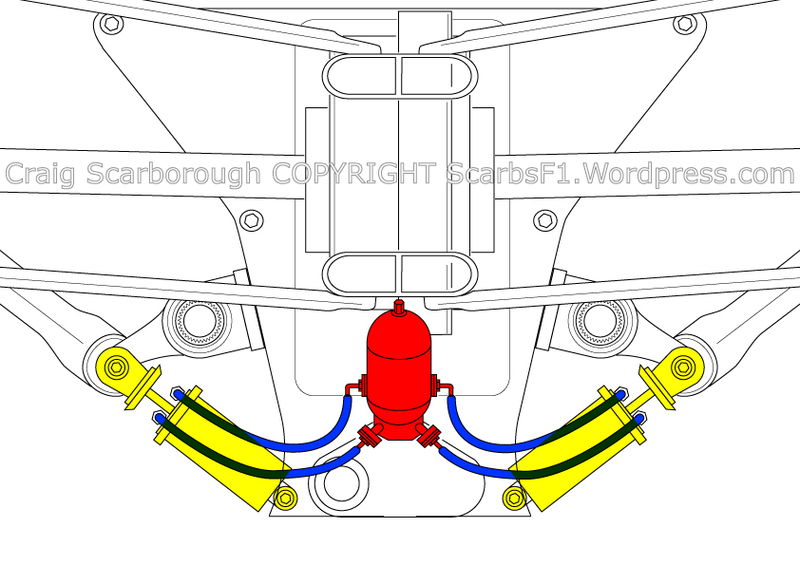 Where fluid lines are used to link the suspension in a similar manner to the Mercedes system I detailed earlier this year (https://scarbsf1.wordpress.com/2011/10/17/mercedes-innovative-linked-rear-suspension/). Perhaps the longer fluid lines to link front and rear suspension provided the discovery, rather than the very short left to right linking pipework. 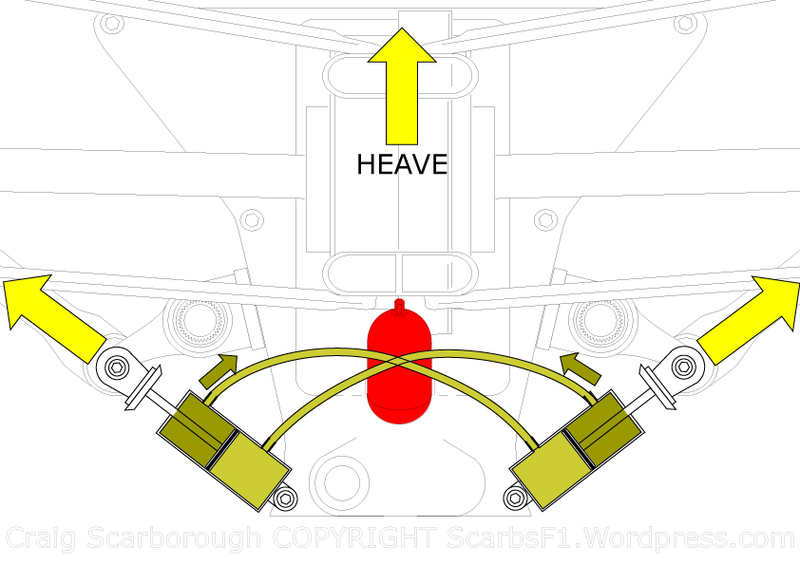 I understand Renault have had hydraulically linked suspension on the car since at least 2009. With this insight LRGP have proposed a Fluid Inerter using both the inertia of the fluid and a spinning mass. 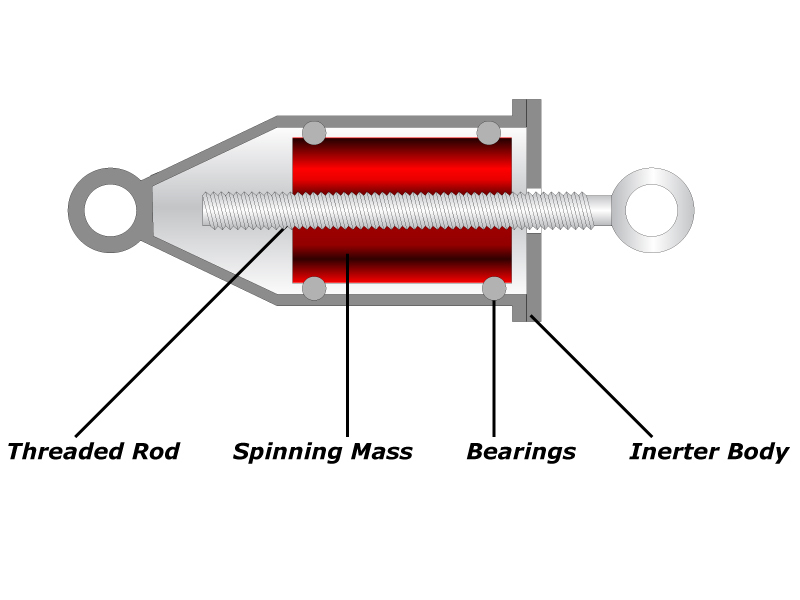 By making the Inerter device more like a damper, where by a damper rod displaces fluid; this fluid is then piped into a circuit to spin the mass. There by both effects can be created. It is the inertance of the fluid that differentiates the LRGP patent to the conventional Inerter proposed by Dr Malcolm Smith. Inertance is a new term and I’ll quote the patent for LRGP’s explanation of the effect. “Hydraulic fluid inertance means” concerns an arrangement in which the presence of a hydraulic fluid provides an inertance, where inertance is a measure of the fluid pressure which is required to bring about a change in fluid flow rate in a system. Between the terminals this translates to an inertial force which resists acceleration. LRGP found that the fluid used was critical to the efficiency of the design. In particular to make it effective for the lightweight and small packaging volume required to make the device work within the tight confines of an F1 footwell or gearbox. Needing to be incompressible and low viscosity, they have proposed several fluids, such as water and oil, but the preference appears to be for Mercury. Although a metal, it’s liquid at ambient temperatures and very dense. This means smaller fluid lines filled with mercury will provide the necessary inertance, compared to larger amounts of less dense fluids. 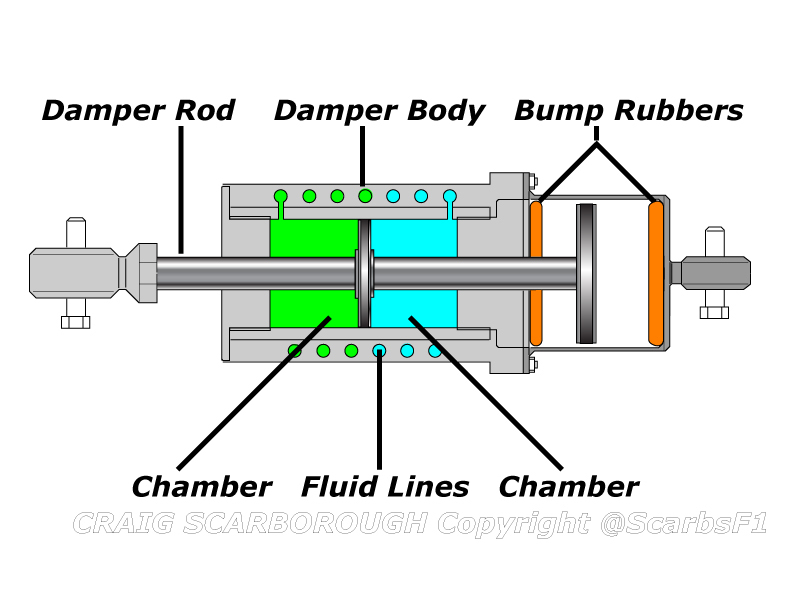 Passing from one chamber in the damper body via the fluid line to the other chamber, the detail design of the length and diameter of the fluid lines are key in creating the correct tuned inertance effect. Just “1 to 50g” of fluid is required to get the desired effect. The range of inertial reaction is quoted as “10 to 500kg, which is a typical range required in Formula One racing cars”. As a side note McLaren decouple this inertial reaction force into different measured units. Rather than Kg of Inertial force, McLaren use the term “Zog”, this allows them to hide the actual units set up on their Inerter. Renault suggests winding the lines around the damper body as one solution for the packaging of the fluid circuit. Additionally a valve or shim stack in the damper rod would also alter the amount of fluid displaced, to further tailor the Inerters effect. With Mercury having a high coefficient of thermal expansion, the patent suggests using a relief valve emptying into another chamber is used to ensure the system has a constant volume of fluid. Clearly the emphasis is on the fluid to provide the inertance effect, the patent citing a minimum 50%, up to as much as 90% of the inertance coming from the fluid. Not only does the Patent contain the conceptual information on the Inerter, but also detailed cross sections. I have simplified these to explain the Inerters construction. LRGP have been able to condense the entire solution into a single self contained component, which fits into the same volume as the conventional Inerter. The device is made up of a main body and a damper rod. The main body split into left and right sections bolted together. The left hand casing forms the cylinder, not only contains the fluid, but also channels machined in the outer casing form the fluid lines. Such that no external pipework is required. The right hand casing allows the damper rod to pass through and also houses bump stops to prevent the device bottoming at the end of its 16mm of bump travel or 23mm of droop travel. In total the device is just 220mm long (eye to eye). In cross section we can see the casing is a complex machined part. With the right hand chamber formed with bushes, seals and endplates to create the cylinder for the damper rods to pass through. The damper rod along with its shim stack valve pass through the cylinder like piston as the suspension compresses and rebounds. The mercury within is displaced and passes through channels into the channels machined into the wall of the body. LRGP provide a diagram for the Inerters mounting. This being a typical position between the pushrod rockers. No doubt a similar mounting is found between the rear pull rod rockers. Externally it would be hard distinguish the Fluid Inerter from a Mechanical version. Albeit the Renault front bulkhead design shows almost nothing of the Inerter inside the footwell. The steering rack and anti roll bar getting in the way of the small aperture inside the front of the monocoque. Thus we cannot be clear if the device has raced. One benefit is the technology is proprietary to LRGP and not used under license via Penske or Dr Malcolm Smith. Thus LRGP are free to use and develop this technology freely. I couldn’t state whether the Fluid Inerter has any compliance benefits over a mechanical one. Perhaps it’s easier to tune via the shim stack in the damper rod, rather than the fixed specification of the mechanical Inerter. Equally it may be easier to maintain, teams needing to strip clean and re-grease their Mechanical Inerters frequently to maintain their smooth operation. It seems one advantage to this device might be lightweight. The tiny amount of fluid required would be lighter than an equivalent spinning mass. 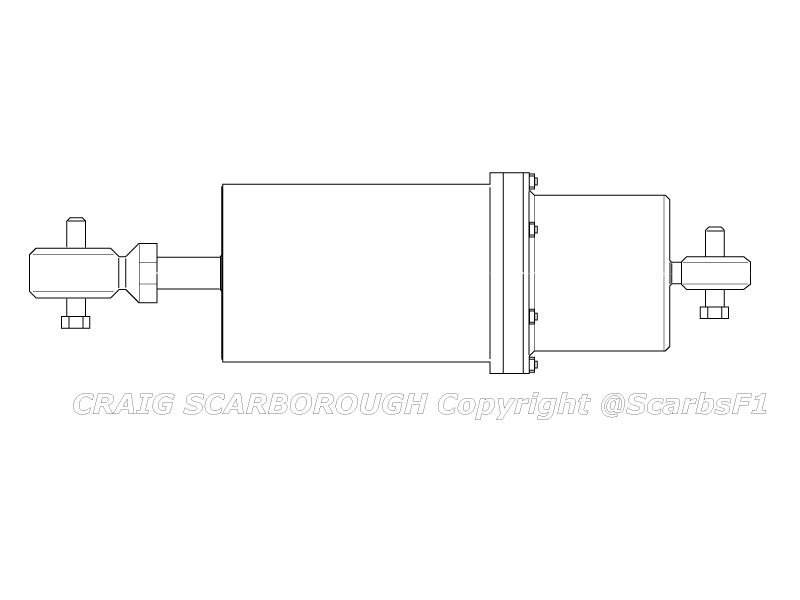 As Inerters tend to be mounted relatively high a weight saving will aid CofG height, as well as ballast placement. One negative issue is that Mercury is a hazardous material. Considering the unit is positioned ahead of the driver’s legs, any mercury leakage as a result of a major accident will only complicate the health issues for the Driver and Marshalls. I am not aware of Mercury being specifically restricted by the FIA approved material list. Although with just a few CC’s of the liquid contained within the cylinder, this might not be regarded as an issue by the FIA. It will be interesting other teams come forward with new Inerter or linked suspension solutions. The only problem is few teams patent their design to allow us such insight to their design. 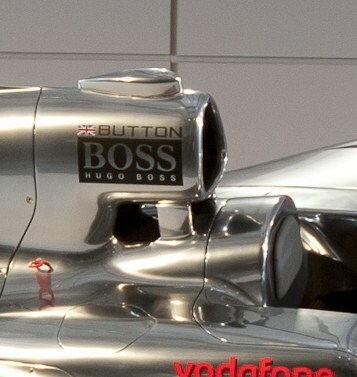 An excellent Sutton Images picture seen on F1Talks.pl, taken through the aperture on the front of the McLaren has given us a rare chance to see the set up of the front suspension. Typically most teams follow the same set up for the front suspension in terms of the placement of the rockers, torsion bars, dampers anti roll bars and heave elements. As unlike with rear suspension, the raised front end almost dictates a pushrod set up in order to the get the correct installation angle of the pushrod. 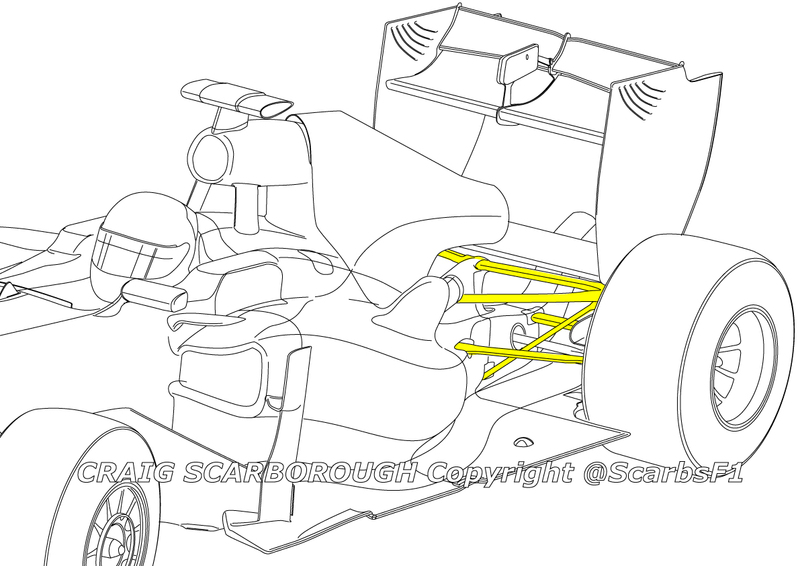 However the McLaren antiroll bar shows there is some variation in comparison to the norm and also highlights Ferraris similar thinking in this area. In comparison to my more recent posts, this is not a breakthrough in design, simply a chance to see the teams playing with packaging to achieve similar aims. 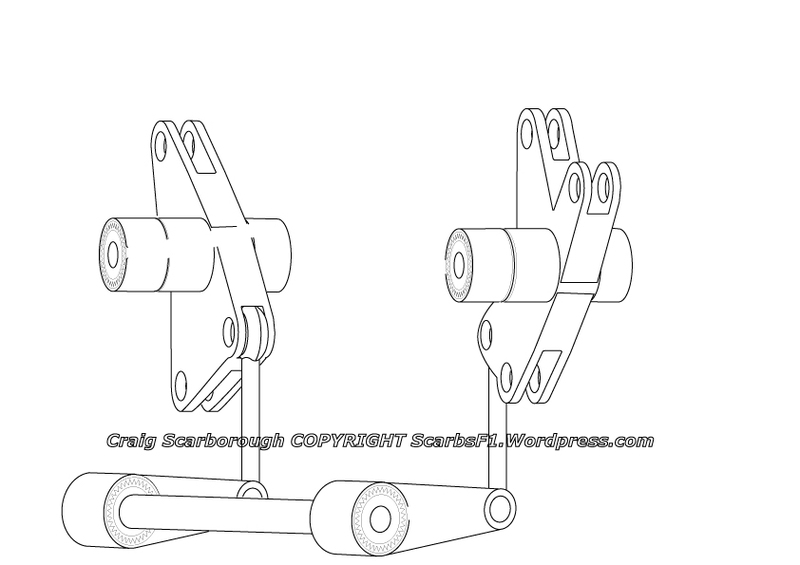 As an overview of the conventional of the rocker assembly in the attached diagram shows the rockers are operated by the pushrod, a lever formed by the rocker operates each of the suspension elements. 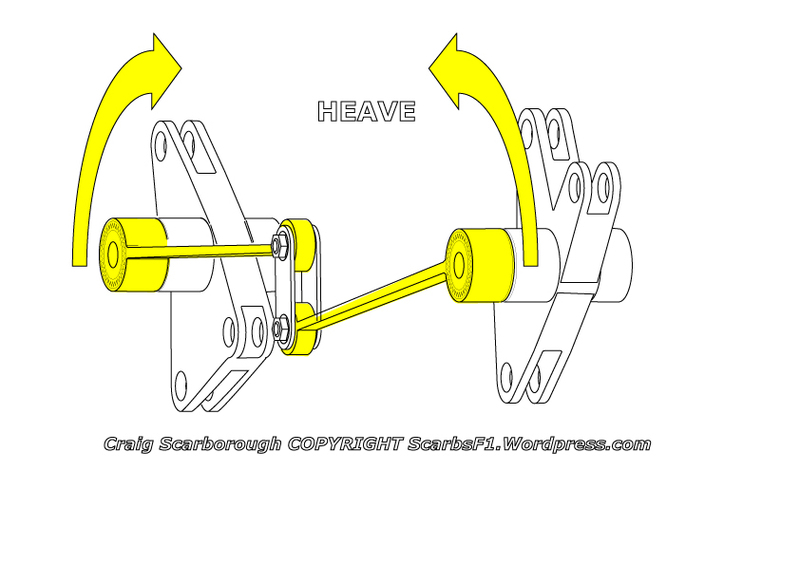 Compressing the heave spring and wheel dampers, extending the inerter and twisting the torsion bars. 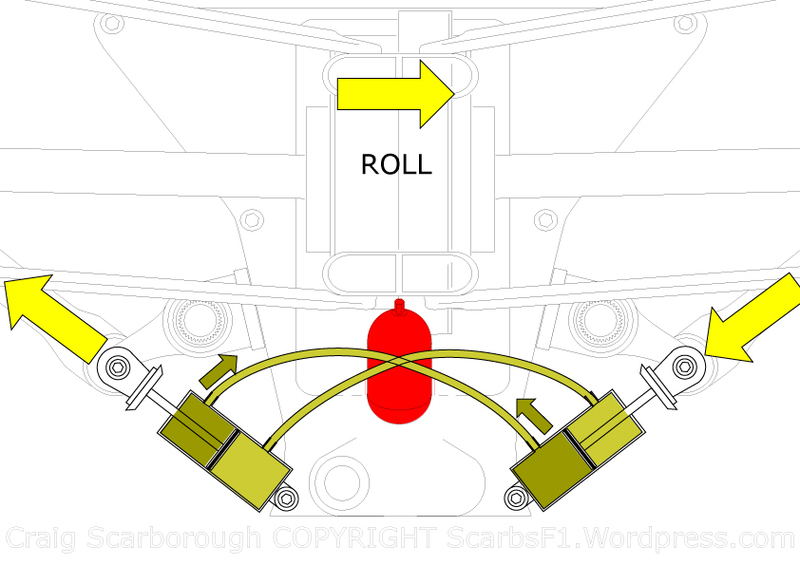 Typically teams use a “U” shape anti roll bar (ARB). 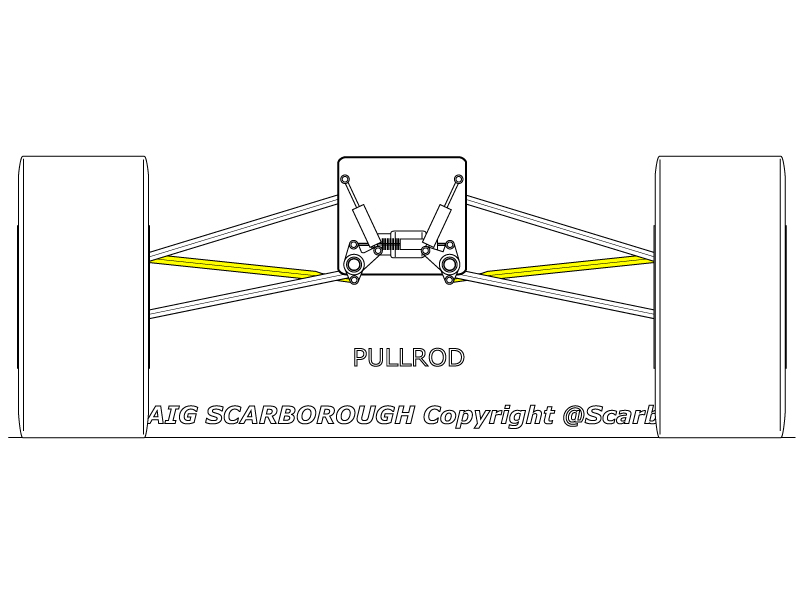 In this set up the antiroll bar is connected to the rocker via drop links, and then each arm twists the torsion bar when the car is in roll. When the car is in heave (car going up and down, no roll) the ARB simply rotates in its mounts and adds no stiffness to the suspension. Different torsion bars in the anti roll bar create different roll stiffness rates for the suspension. Teams will either switch the entire ARB assembly for a different rate ARB. 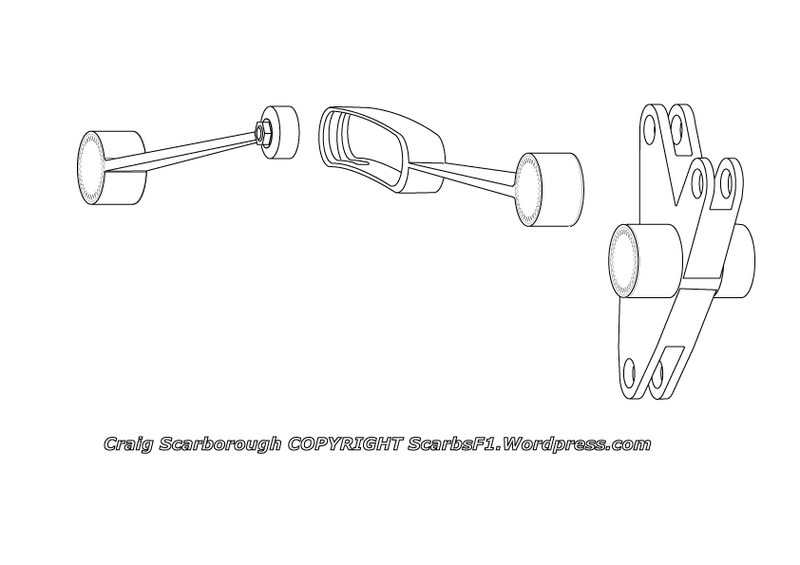 Red Bull have engineered their ARB for the torsion bar to be removed transversely through the side of the monocoque, in a similar fashion to removing the normal torsion bars. However McLaren and Ferrari have gone a slightly different route. In McLarens case their ARB is a simple blade type arrangement. These blades are splined to each rocker the blades are joined at their ends by bearings and a drop link. When in roll the rockers rotate in the same direction, one blade goes down and the other goes up, the stiff drop link transfers these opposing forces and the blades flex. These opposing forces add stiffness to the front suspension in roll. In heave the rockers rotate in different directions, both blades move down and the increasing gap between their ends is taken up by the drop link. So the blades do not flex and do not contribute to heave stiffness. Different thickness blades create different roll stiffness; they must be removed from the rockers and replaced to achieve this. 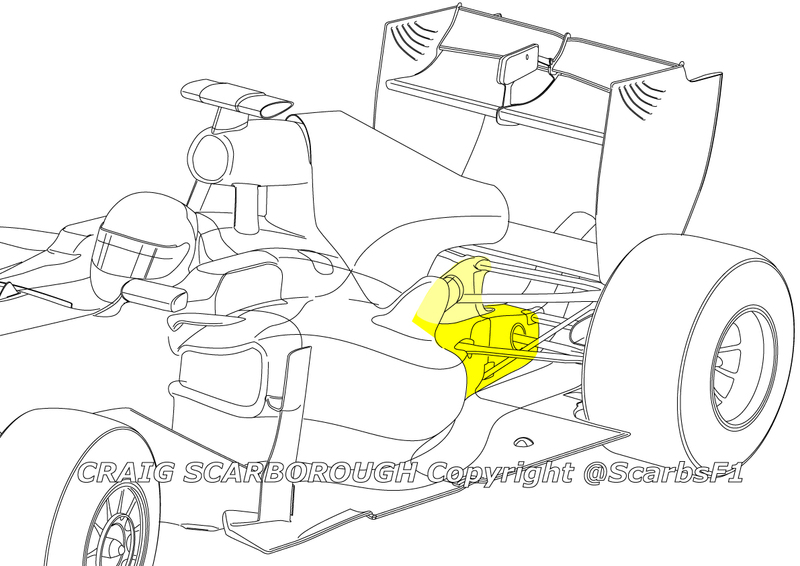 Ferrari have used this solution at least since the late nineties, the idea has been seen on older Minardis too. I suspect the idea was taken to Minardi by Gustav Brunner, who may also be the creator of this elegant solution. 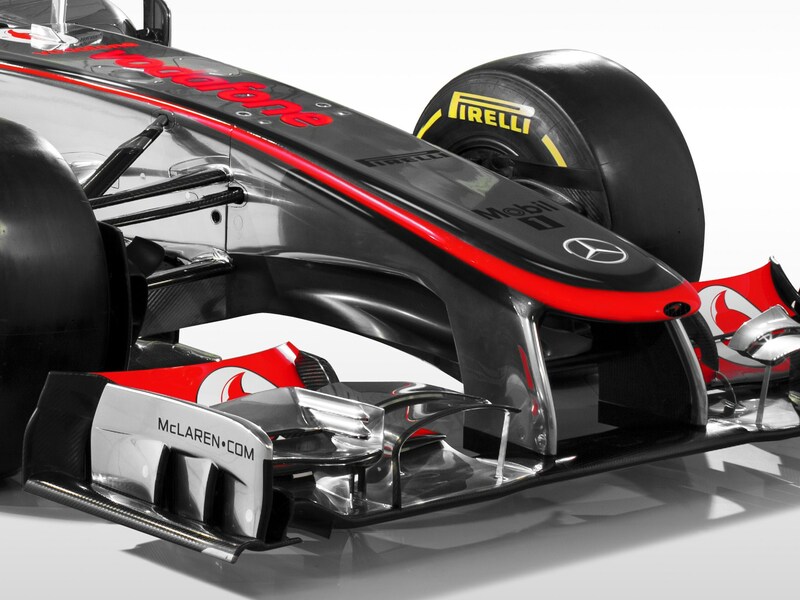 Similar to McLaren the roll stiffness is provided by blades splined to the rockers. 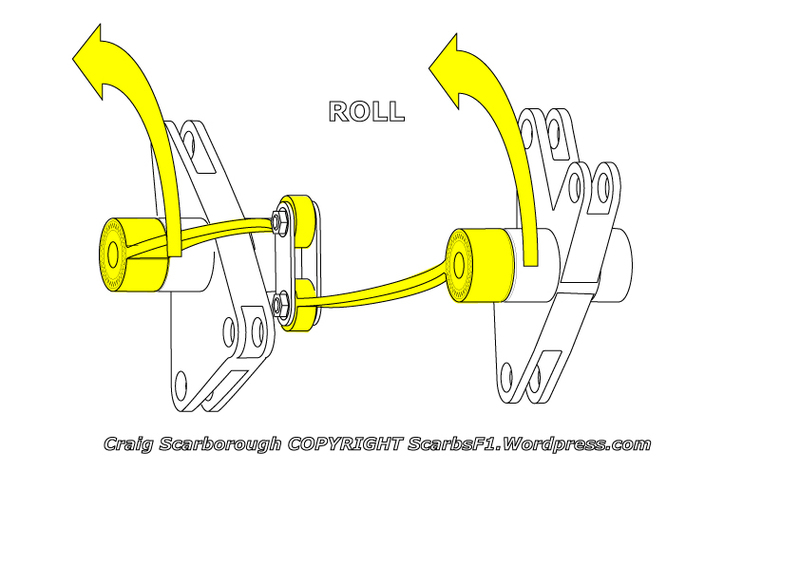 But the connecting mechanism is instead a single bearing sliding inside an arched guide. Just as with McLaren ARB, when in roll the two ends push against each other to create the reaction force to prevent roll. When in heave the bearing slides through the arc of the guide and no force is passed into the suspension. I don’t believe either of these solutions has a compliance benefit over the other. 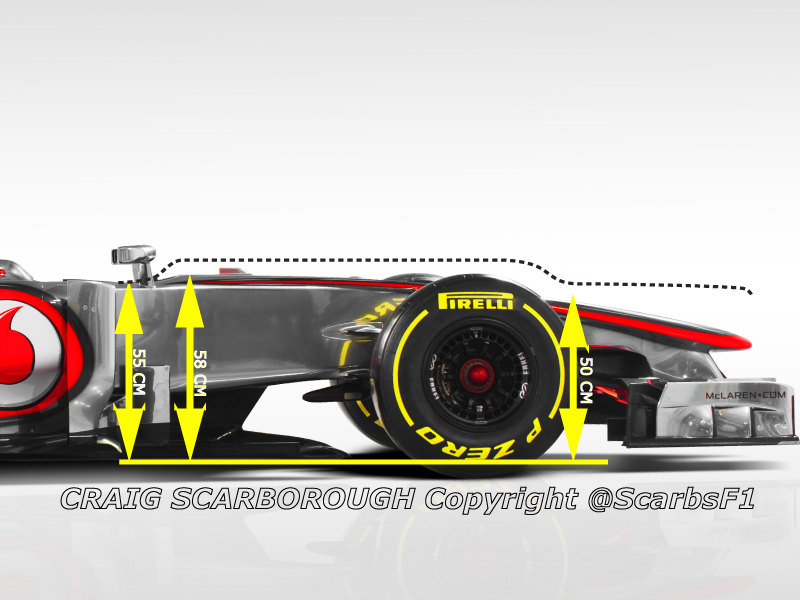 The McLaren\Ferrari systems may be take up a little less space inside the nose and may weigh a little less. But both will be a little more complex when changing the roll stiffness. As we get towards the end of the season we often see teams start to get relaxed with the usual secrecy in the pitlane. This weekend in Korea was no different with several technical details being bared to the cameras for the first time. The surprise is that Mercedes appear to have adopted a hydraulic solution for managing rear roll and\or heave stiffness. Nothing is new in F1, this solution closely matches the aims of the 1995 Tyrrell Hydrolink system, which I hope to cover in detail in a future blog post. Indeed this is not even new in current F1, as several other teams already run similar and perhaps even more developed systems. But this is the first evidence I’ve had of teams interconnecting the suspension with hydraulics. 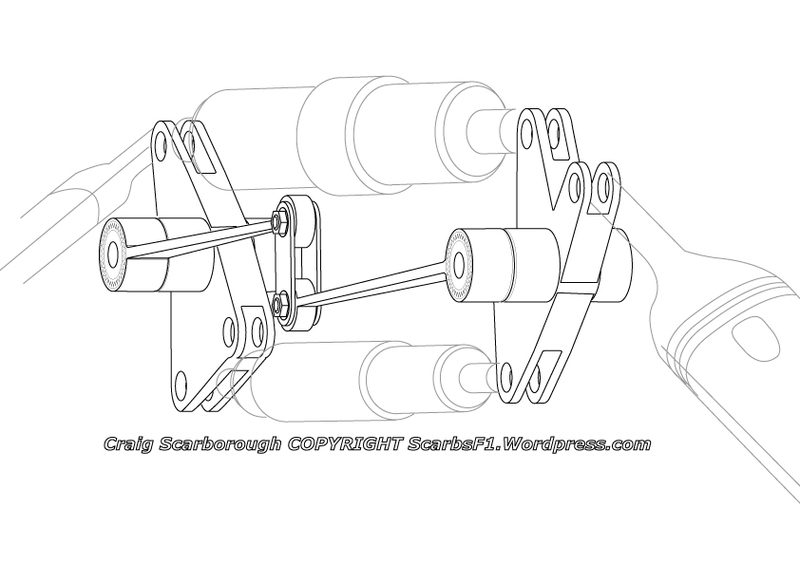 I spoke to renowned race car designer and suspension expert Andy Thorby about the use of just such a system, “I think most or all the teams are using linked hydraulic actuators on the corners.” adding “they allow you to tune the attitude change of the car under aero load, independently of corner spring rates” by altering both heave and roll stiffness. Mercedes were one of the many teams to switch to pull rod suspension for 2011, to gain the aero benefits and a lower CofG. With space at a premium at the back of an F1 car, compromises in packaging the various suspension elements need to be made. At its launch it was clear the Mercedes pull rod arrangement placed the rocker quite rearward, in comparison to other pull rod arrangements which place the rocker towards the front of the gear case. The conventional forward rocker placement, puts the heave spring and antiroll in the space at the front of the gear case, packaged around the clutch. In Mercedes case the rocker is packaged the other side of the gear cluster, just under the gearboxes cross shaft. This leaves little room for the antiroll bar and heave spring. It does however place the rocker and torsion bars very low for the benefit of packaging, aero and CofG. Albeit these are small benefits, perhaps Mercedes choice of a short wheel base did not leave space for the suspension to be packaged around the clutch, as the gearbox length is a critical factor in wheelbase length. So left with the lack of space to place either a mechanical heave element or a antiroll bar, it appears that Mercedes have opted to create a passive hydraulic system. This is not to be confused with any form of active suspension or the cars high pressure hydraulic systems, this system will be entirely self contained to remain within the rules on suspension design. As the system reacts only to suspension loads, it is clearly legal and there is no question of interpretation in its acceptance by the FIA. What Mercedes have in place of a conventional anti roll bar and heave spring are hydraulics units (yellow), which probably also act as the dampers. These are connected via fluid lines (blue) to the central valve block and reservoir (red). 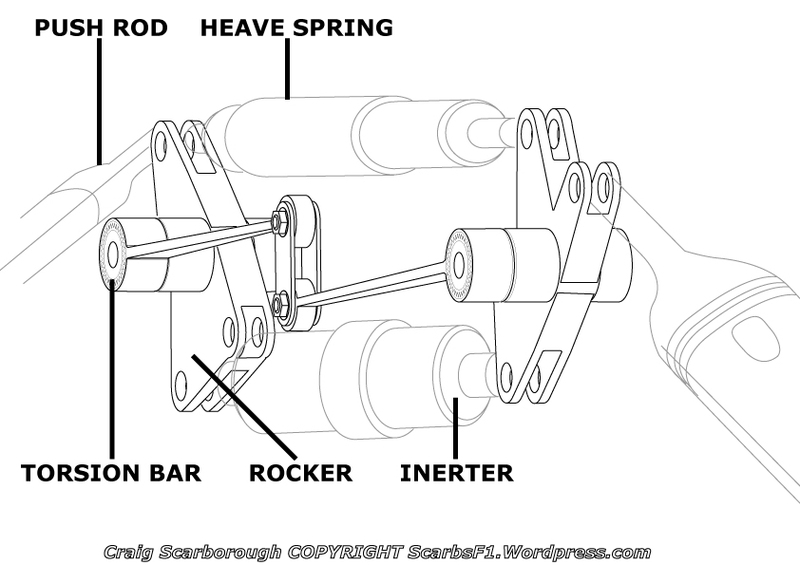 Springing for the rear wheels is managed by the torsion bars. 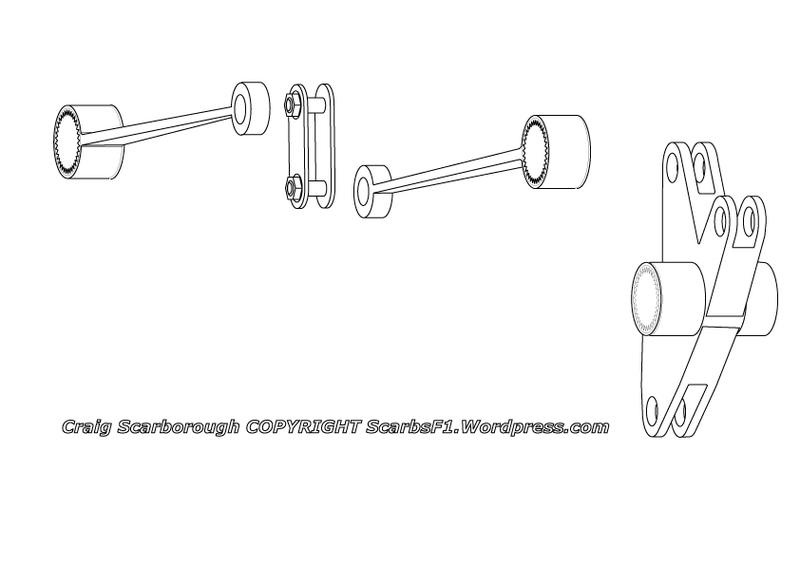 One end of which is conventionally located within the rocker pivot, the torsion bar then leading forward and connecting to the front of the gear case. There is still some hardware at the top of the gearbox, which looks like it might be the mounting for an anti roll bar (ARB). But in this set up, its hard to see how the suspension rocker will act on the ARB. So Its not clear if the car started the season with a mechanical system, or whether it was designed purely with this solution in mind. The teams early season struggle with rear tyre wear, may or may not be attributable to this system. 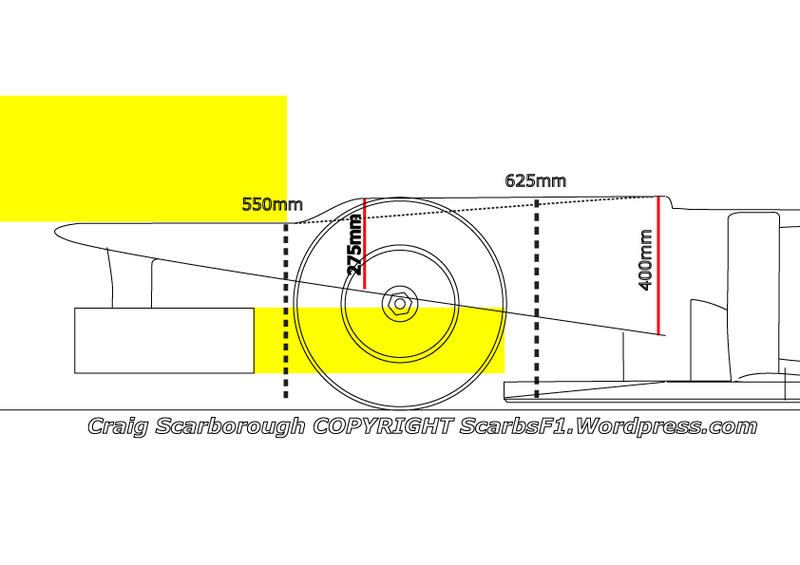 My feeling is that other rear suspension and car layout factors have influenced the tyre problem, to a greater degree than this hydraulic solution. Although in a car that had a difficult pre-season and fundamental design problems. Getting the hydraulic suspension to work as well, may have been just another drain on resources for a team trying to recover its pace. A cars individual wheel dampers displace hydraulic fluid as the suspension moves, creating higher pressure in one end of the damper and lower pressure in the other. To act as a damper, valves in the damper control the rate in which the fluid moves between the two chambers to create the damping effect. In the passive hydraulic unit, the fluid is displaced not from one chamber to another, but via pipes through a valve block and into the opposite hydraulic unit. How the upper and lower chambers are interconnected left to right make the system react differently to inputs from the suspension. These being a resistance to roll or heave. In a simplified view we can see the system working in two modes, with the fluid lines in ‘Parallel‘, where one units upper chamber connected to the opposite units upper chamber. Or, in ‘Crossover‘, where the upper chamber in one unit is connected to the lower chamber in the opposite unit. In each mode we can see the effect of the car in roll (tilting from cornering loads) or heave (going down from aero or braking loads). When the car is in heave, both upper chambers create high pressure. This creates resistance between the two systems wanting to displace their fluid. This has the effect of increasing the cars heave stiffness. When the car is rolling, the upper chamber on one side and the lower chamber on the other side create high pressure. As these chambers are now connected to the lower pressure chambers on their opposite side, the fluid displaced with little resistance. This presents no increase in the cars roll stiffness. When the car is in heave, both upper chambers create high pressure. As these chambers are now cross connected to the lower pressure chambers on their opposite side, the fluid is displaced with little resistance. This presents no increase in the cars heave stiffness. When the car is rolling, the upper chamber on one side and the lower chamber on the other side create high pressure. As these chambers are cross connected to the high pressure chambers on their opposite side. This creates resistance between the two systems wanting to displace their fluid. This has the effect of increasing in the cars roll stiffness. If a team simply want a hydraulic system to create one suspension effect, then they can rig up a basic system based on one of these patterns. However, with a valve system connecting in the centre of the pipes, then a single pair of hydraulic units and would be able to control both heave and roll stiffness. Such a system would not need external pressurisation or any control software to operate the valve block. However these systems are still present handicaps to development. Friction in the valve seals and the valve block, will create heat and variances in the systems response. This heat will be an enemy of the system, as it effect on the volume of fluid in the system, thus the stiffness the system provides to the suspension will alter. As a result the system will need to be a ‘constant volume’ system. Where the volume of fluid is managed depending on its rate of thermal expansion. This is probably part of the function of the small reservoir mounted to the valve block. Equally important is the ‘installation stiffness’ of the system, that is the flexibility of any components, especially the flexible fluid lines, as this will alter the systems response. But these and other issues related to hydraulic systems is already well understood by the teams with similar hydraulics being used both for the braking system and the high pressure electro-hydraulic control systems. One area which presents trouble to the teams is the modelling of these systems. The design and simulation of the hydraulic element is not necessarily covered by conventional suspension and ride simulation software. I asked , Peter Harman, Technical Director of Deltatheta Ltd (http://www.deltatheta.com) about these issues. “I have advised teams on how best to simulate them“ adding “it sounds like it is a common development“. The problem is the hydraulic elements don’t fit in with conventional suspension design software. As Peter explains “Traditionally car companies have used MSC Adams for suspension modelling, and this has been adopted for ride simulation by most F1 teams, however Adams is really just a mechanical tool and doesn’t do hydraulics well“. Thus teams need to alter their approach, needing specialist add-ons and code to augment the already well established suspension development solutions. Of course the systems will also be physically rig tested in back to back comparisons with their mechanical counterparts on the teams multi-post rigs. Overcoming these issues with good approach to the detail design work, a hydraulic system should be able to get very close to the response of a Mechanical system. However the potential of the Hydraulic solution does offer some other benefits over purely mechanical systems. Once you have the ability to independently tailor the damping and stiffness of the heave and roll functions. The next obvious step is to control the pitch of the car. Pitch is when the car brakes or accelerates, one end of the car moves down and the other moves up. Braking creates a forward pitch, with reduced front ride height and greater rear ride height. Acceleration is the opposite situation. 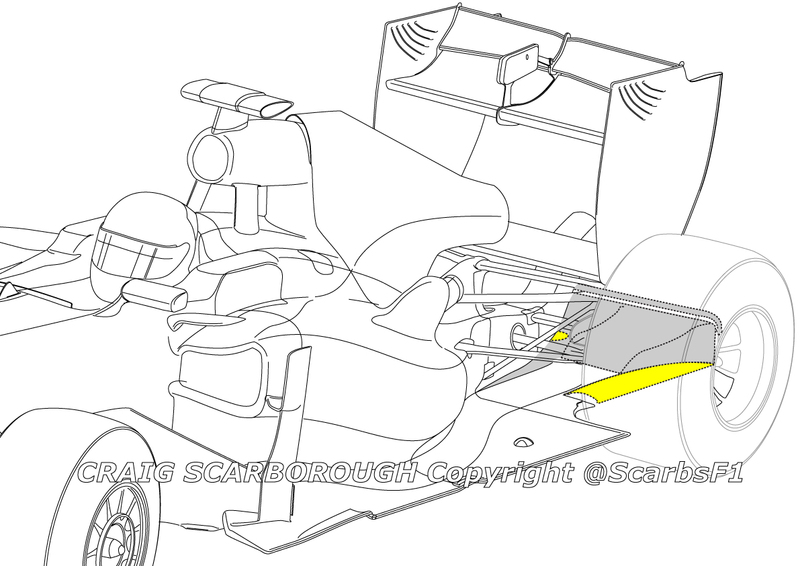 As we’ve seen for the past few years controlling pitch is critical to maintaining a low front wing ride height, with out sacrificing splitter wear or excessive rear ride height (thus rear downforce). 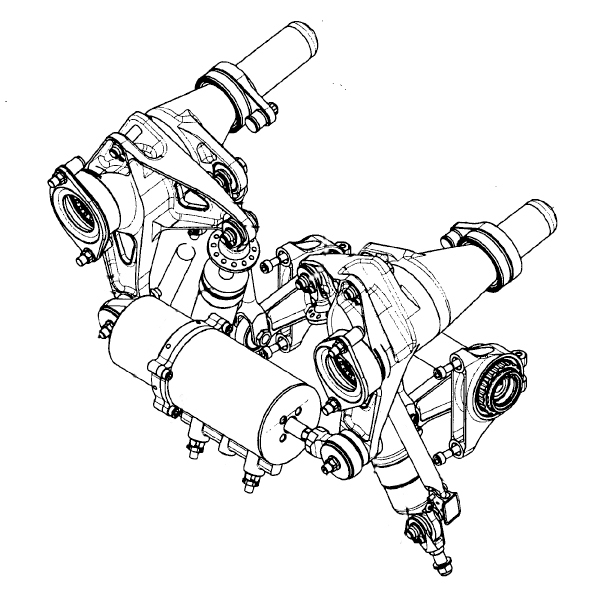 Linking the hydraulic units\valve blocks between both front and rear axles, will allow the same resistance to pitch, as it does to heave on just one axle. This will increase the front heave stiffness, reducing forward pitch and preventing the splitter grounding excessively. This effect under braking could be further augmented with either gravitationally load sensitive valves, altering the displacement of fluid front to rear. 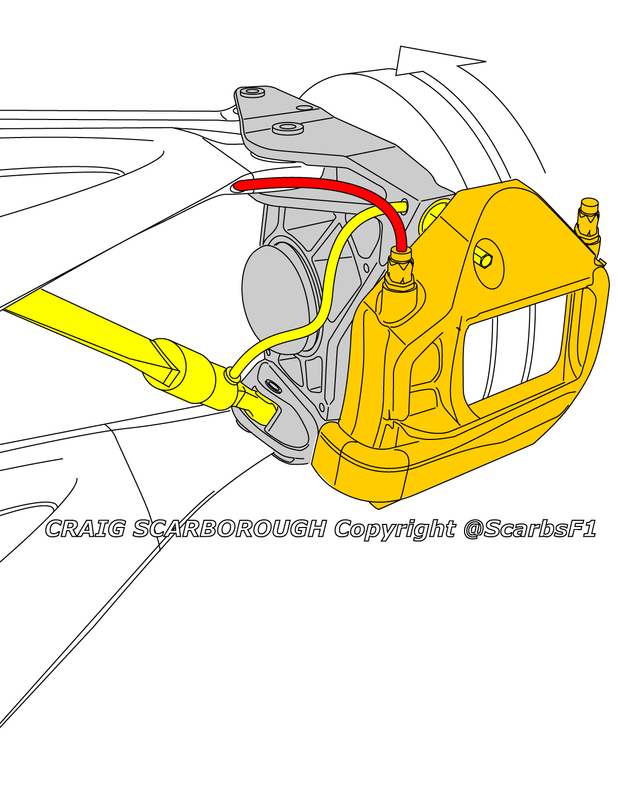 Or similarly, a valve directly controlled by brake pressure. The former G-load system already in legal use on the individual wheel dampers and the latter solution a common fitment to motorbikes in the eighties, often termed Anti-Dive. With Rake being ever important to the cars aero set up, such linked systems are increasingly being investigated by the teams. Indeed one team has run such a solution since mid 2009 and at least two other teams (one at each end of the grid) ran them last year.